Richard Nash wrote me: "A good friend of mine, Bill Hill, has allowed me to scan all of his 200 photos taken during the 1960's. 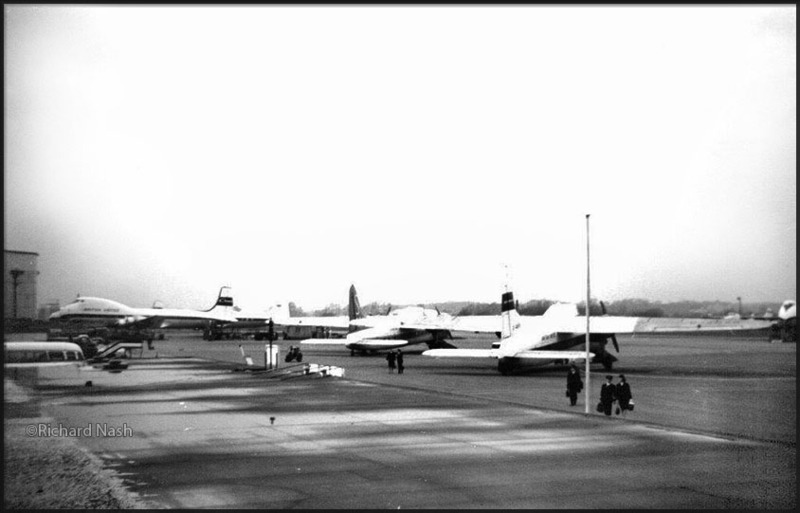 A lot were taken at London-Gatwick, but I am not certain who the actual photographers were, he probably traded." These were compiled, at first, on PAGE ONE. Later I continued uploading batches of photographs others to PAGE TWO; alas, again most of them without much info on 'where & when'. Suggestions welcomed. Compilation of these two pages took over 4 years: Feb.2014 - Sep.2018. The Avro Tudor must have apperaed humongous in those days, the 1950s. Avro's Type 688 Tudor was a British piston-engined airliner based on their four-engine Lincoln bomber, itself a descendant of the famous Lancaster heavy bomber, and was Britain's first pressurised airliner. 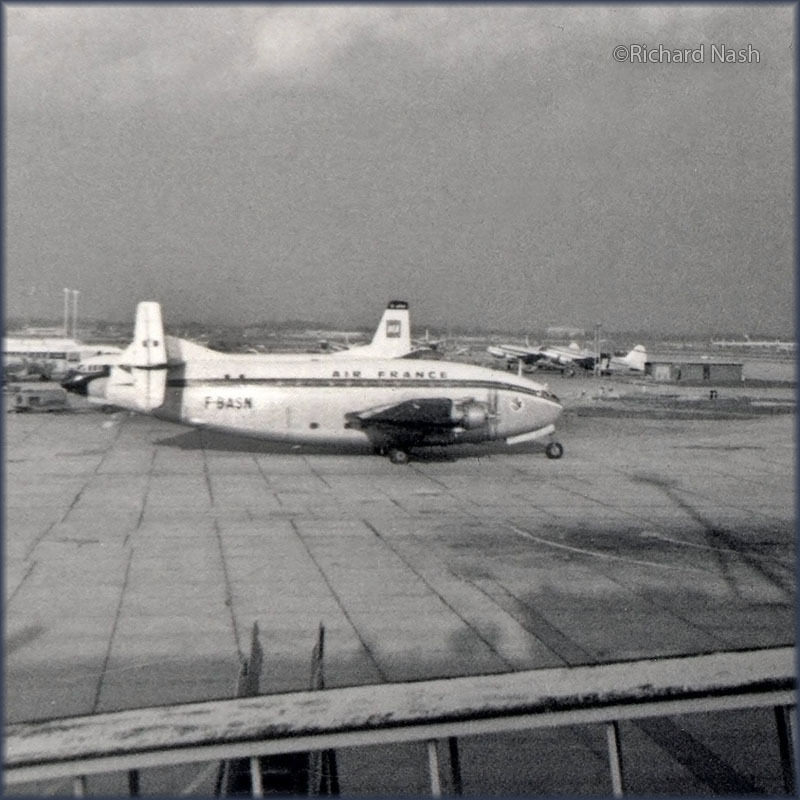 Customers saw the aircraft as little more than a pressurised DC-4 Skymaster, and few orders were forthcoming, important customers preferring to buy US aircraft. The tailwheel undercarriage layout was also dated and a disadvantage. 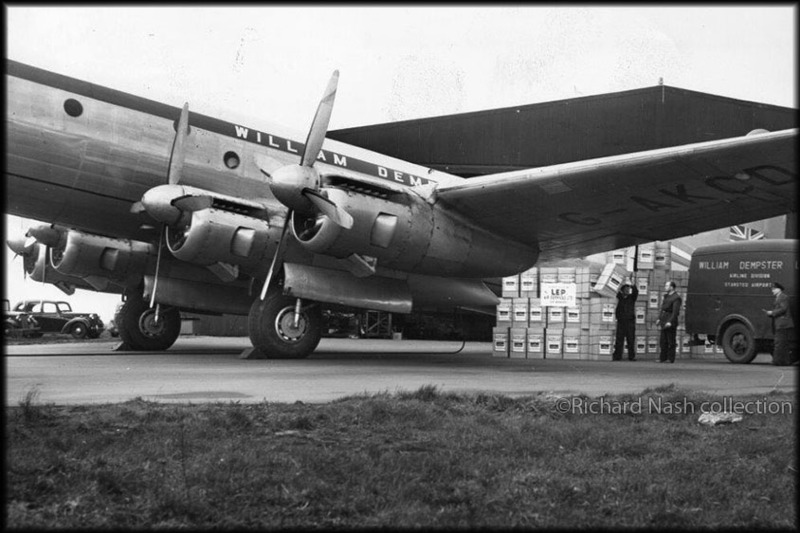 William Dempster Ltd was formed in late 1948 at Backbushe Airport and commercial charter operations started in november with a former Ciro's Aviation Dragon Rapide. 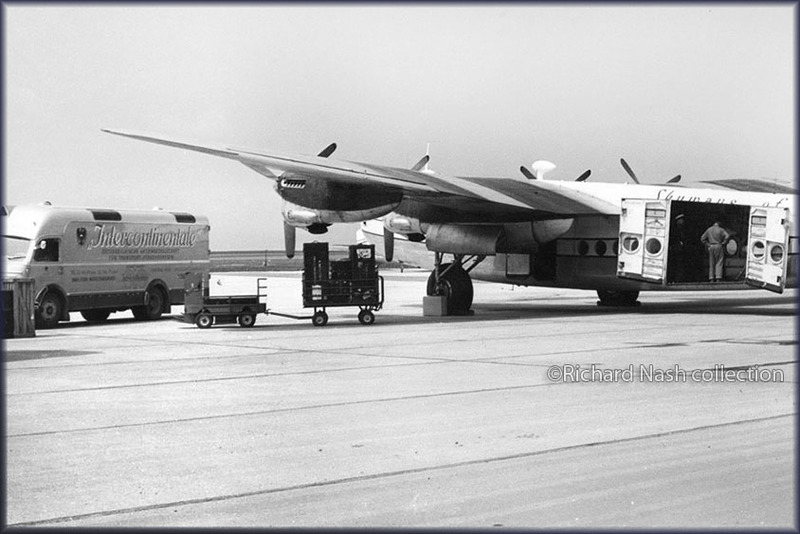 Throughout 1949 two of these were operated on passenger- and cargo charters. In april 1950 two ex/ British South American Airways Avro Tudor 5's were acquired: G-AKCC (c/n 1421) and G-AKCD (c/n 1422). These were converted for use on low-fare tourist services between London and South America. William Dempster worked in close association with a South African charter company, Pan African Air Charter. Pan African flew a weekly Dakota service from Jo'burg-Rand to the United Kingdom. The Tudors continued to ply their ways to S. AFrica during 1950 and 1951. 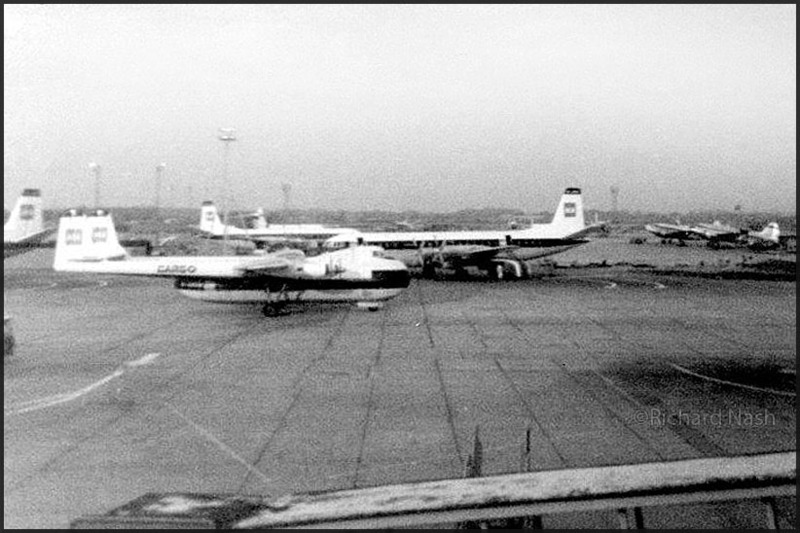 The Tudors flew their services from both Blackbushe as well as Bovingdon Aerodrome. Passengers were ferried on busses from London. 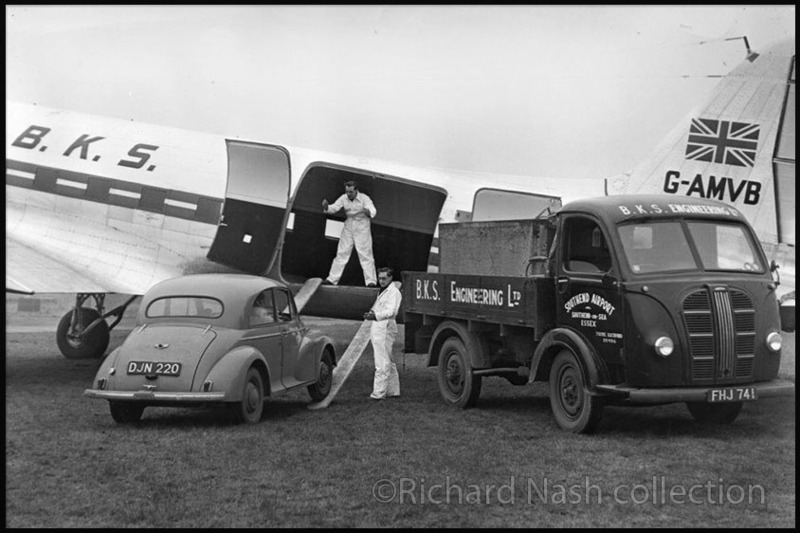 By the summer of 1951 Dempster had transferred his operation from Blackbushe to Stansted. G-AKCC was damaged and written off on 26Oct1951 when it overshot the Bovingdon runway while landing after a flight fromcastel Benito; no one was seriously injured in this incident. The management of William Dempster Ltd found themselves frequently in Courts of Law, for various reasons, including their ties and operation with Pan African AC. During 1952 the Tudor 5 kept its low-fare charter operation to South Africa but was also more involved in charters, both ad-hoc passenger flights as well as freight charters, to Europe, North Africa and Middle East. With a build up of this work a Douglas C-47B was acquired, G-AMSS (c/n 32840), entering service in august 1952. 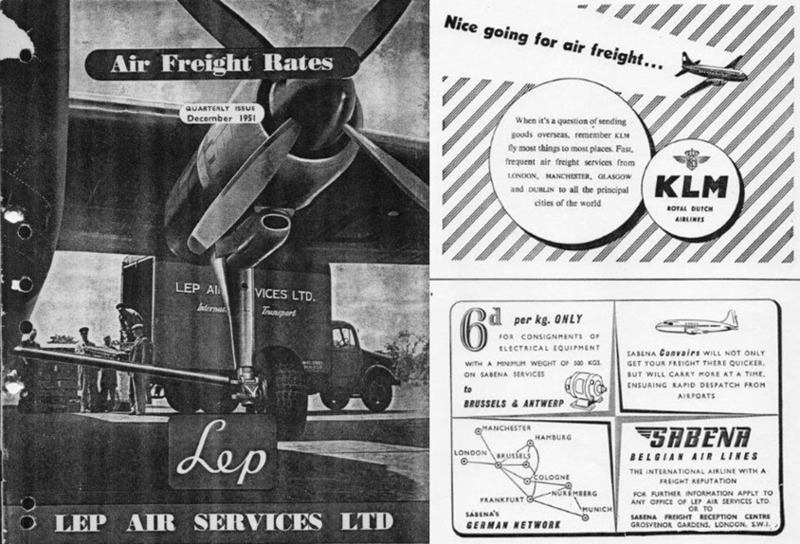 A total of 53 people were now employed by William Dempster Ltd.
At the end of 1953 William Dempster decided to suspend all its flying operations. The DC-3 was sold to Dan-Air early 1954, while the Tudor 5 remained grounded at Stanstedto act as a source of spares for Aviation Traders, who were in the process of rebuilding a number of Tudors for Air Charter. Source: 'British Independent Airlines 1946 - 1976', by A.C. 'Tony' Merton Jones - The Aviation Hobby Shop (tahs), 2000.
visible and has "B.S.A.A." and "Star Eagle"-titles. British South American Airways has a Wikipedia page. used on the Berlin Airlift. G-AKCD was sold to William Dempster Ltd. and flown by them from 1950 to 1954." 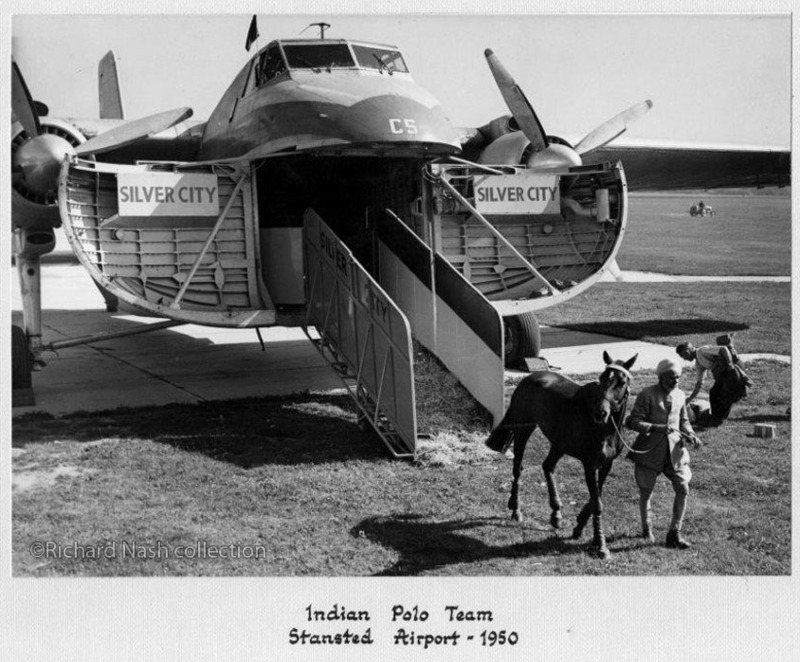 Silver City Airways was a private, British independent airline formed in 1946. It was initially based at Langley Aerodrome, later at Blackbushe airport. The name Silver City was derived from the eponymous Australian mining town at Broken Hill, where The Zinc Corporation was headquartered. Silver City's first commercial flight departed London Heathrow for Sydney via Johannesburg in late 1946. 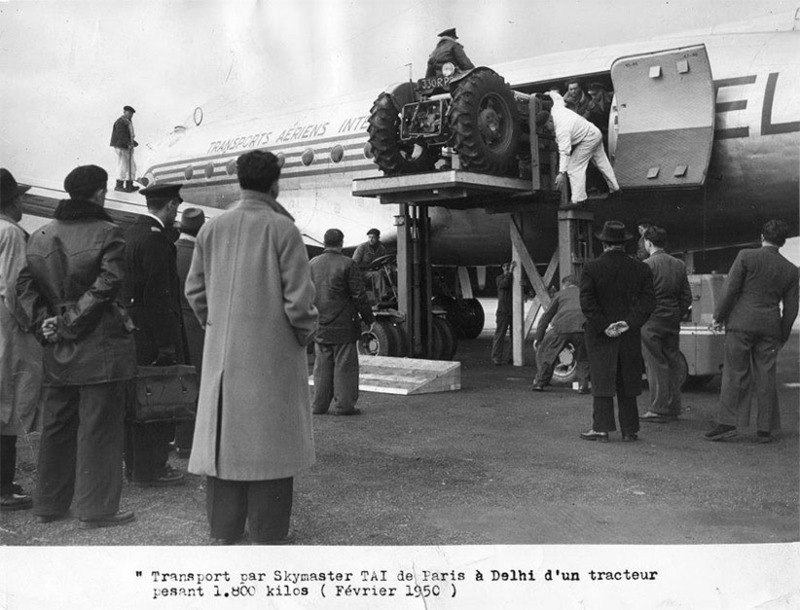 The following year, Silver City leased its first Bristol Freighter, moved its base to Blackbushe and participated in the airlift of Hindu and Muslim refugees between Pakistan and India. 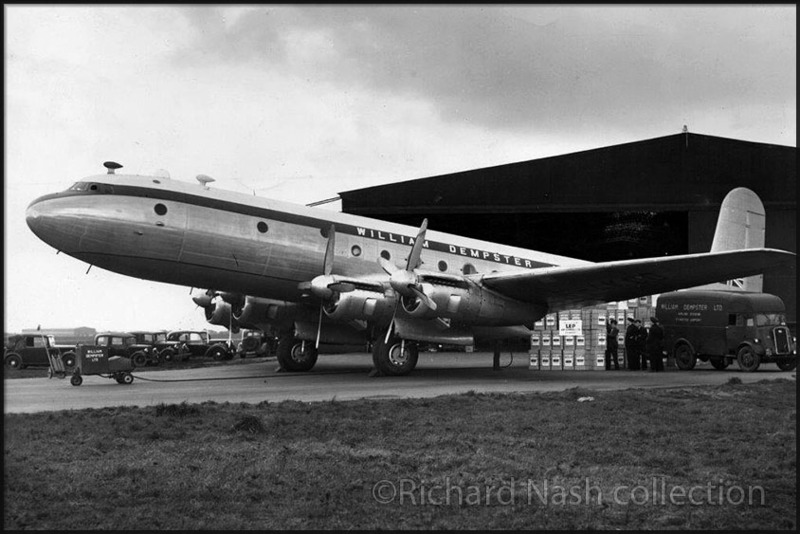 In 1953, Silver City took delivery of its first Bristol Superfreighter. The following year, the company moved to a new permanent home at Lydd Ferryfield, Britain's first newly constructed post-war airport. The same year, Silver City Airways came under the control of the Peninsular and Oriental Steam Navigation Company (P&O). 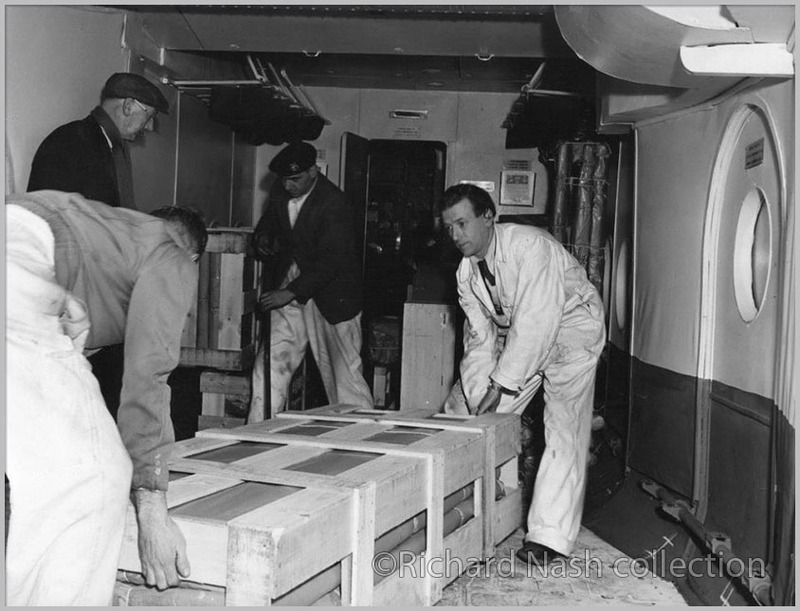 By 1960, Silver City's 40,000 annual cross-Channel flights transported 220,000 passengers and 90,000 vehicles while network-wide freight haulage reached 135,000 tons a year. 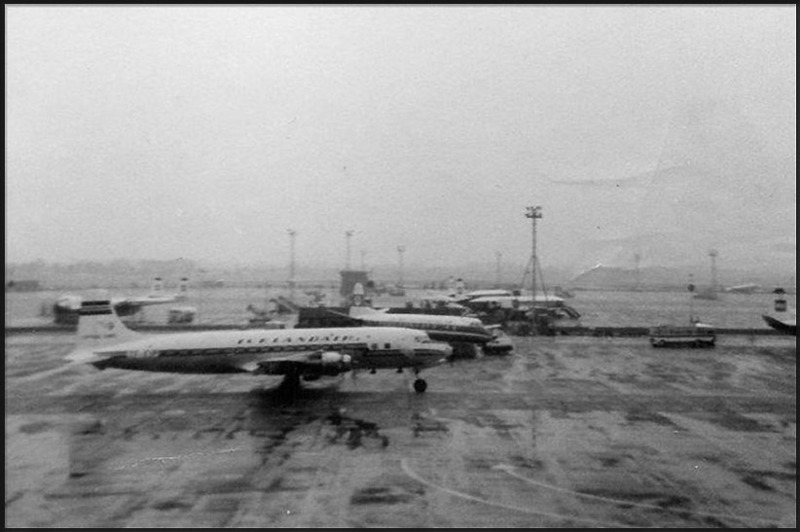 Unsustainable losses as a result of the loss of the Libyan oil industry support flight contract, increasing competition from roll-on/roll-off ferries and the lack of suitable replacements for the ageing Bristol Freighters resulted in growing financial difficulties, culminating in Silver City's takeover by British United Airways (BUA) holding company Air Holdings in 1962. 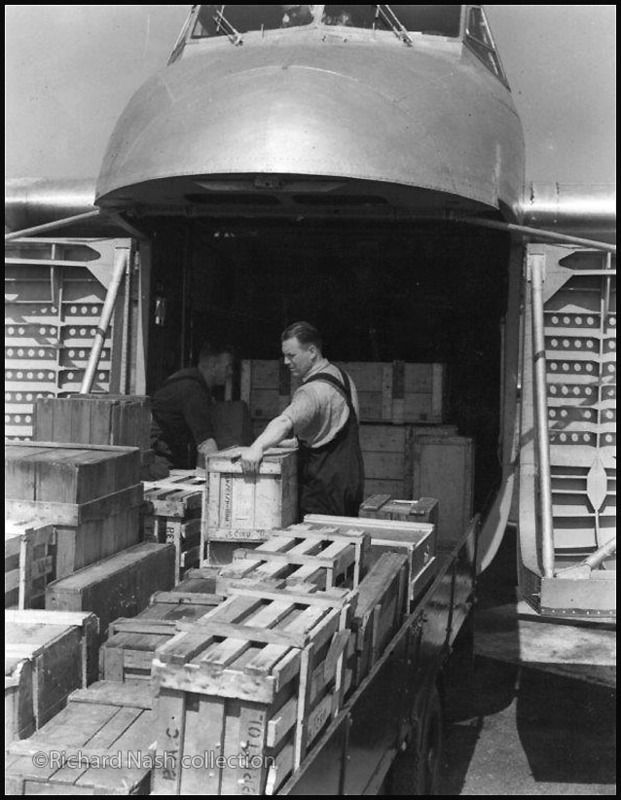 DC-3 being loaded with cargo, livestock in front of a surplus of Dakotas. Airwork was formed in 1928 and initially developed Heston Aerodrome as an aviation and social centre. Besides flying instruction (also at Perth and Shoreham) the company undertook aircraft maintenance and its first air transport experience came in 1932 in Egypt, when it helped set up an airline which is now known as.. Egypt Air! In 1933 Airwork helped to set up Indian National Airways. During WW2 Airwork helped to train the Royal Air Force but when the war ended they returned to commercial aviation.In 1946 a fleet of Dragon Rapides and Vikings was acquired. In 1950 cariied its 10.000th passenger on the service between Wadi Halfa & Khartoum - London. 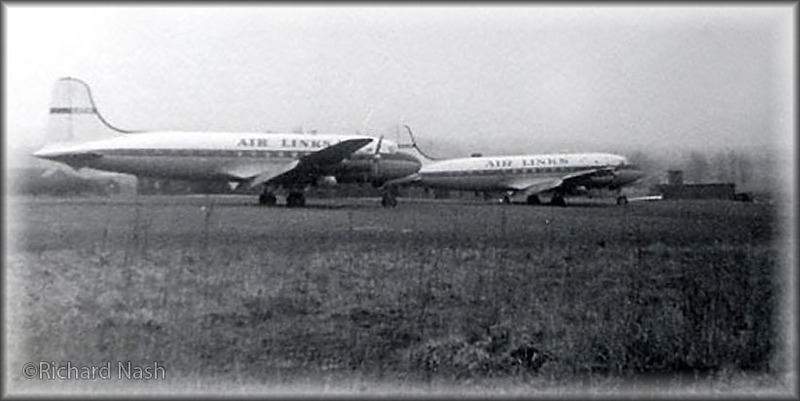 During 1948 Airwork formed a subsidiary company in East Africa named Airwork (East Africa) Ltd with its Hq in Nairobi. Airwork flew 74 sorties for the Berlin Airlift. Airwork continued its contracts for the military and on governmental contracts. In 1952 4 Handley Page Hermes aircraft were purchased from B.O.A.C. for trooping flights to Kenya and the Egyptian Canal Zone. 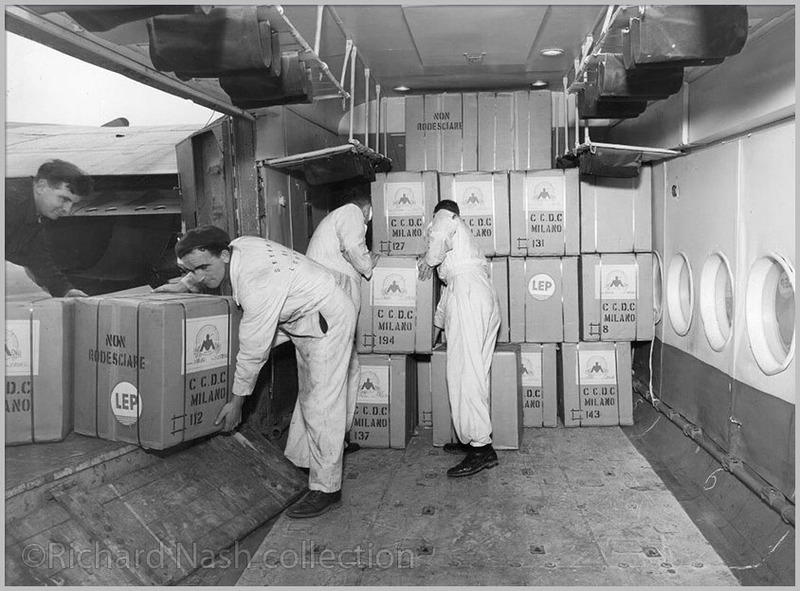 By 1954 Airwork's shareholders included the Blue Star Line and the Furness Whithy Line, both large shipping companies. 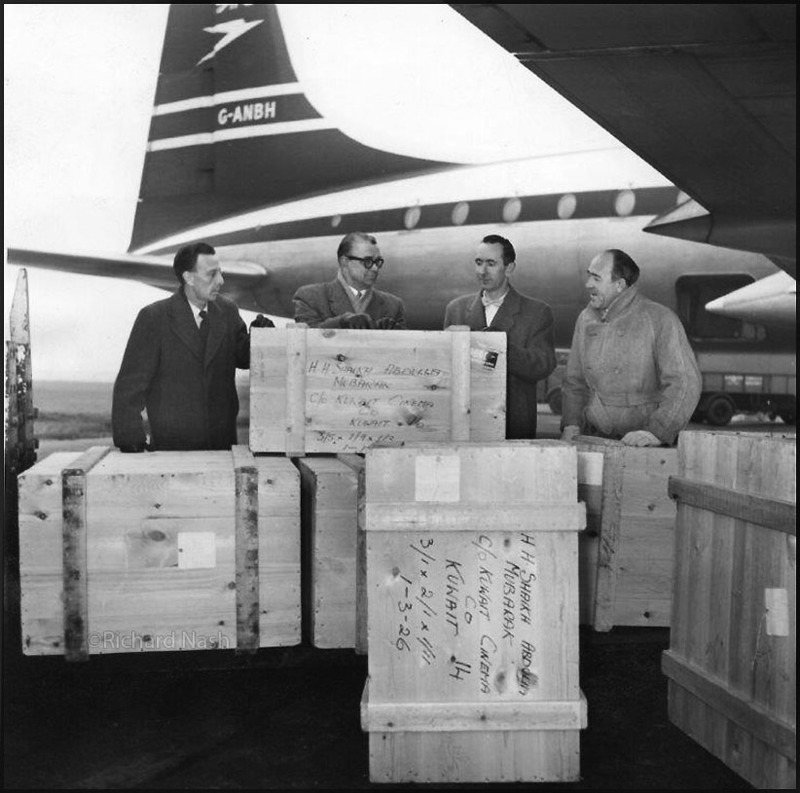 In 1953 Airwork acquired the rights to operate cargo flights from the UK to Montreal and New York. 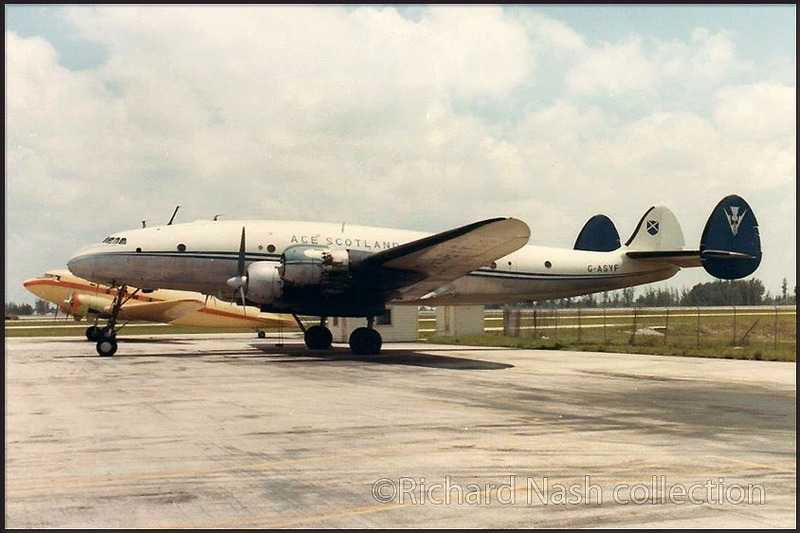 For this two Transocean Douglas DC-4 were leased. The inaugural flight departed London Heathrow on 01Mar1955. But after 9 months these services were suspended. 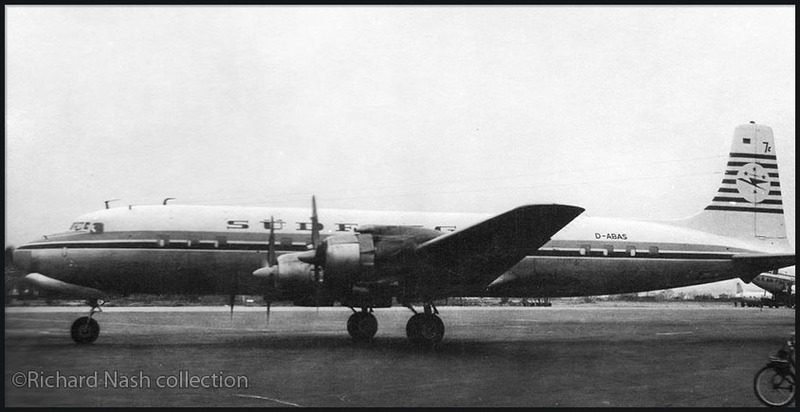 An initial order for two DC-6A's was subsequently cancelled as these were meant to replace the DC-4s. 1956 was a year of consolidation and the fleet consisted mainly of the Hermes for trooping contracts. During 1958 Viscounts replaced the aging Vikings. The Viscount operated the service between the Uk and Khartoum, Sudan via Rome, Athens & Cairo. During 1959 the trooping contracts decreased and the Hermes aircraft were sold or scrapped. On 01Jul1960 Airwork merged with Hunting-Clan and Air Charter to form British United Airways. "I recently retired after 48 years in airfreight. As I was sorting out my rubbish I came across this old air cargo tariff. You might like to see some of the airline adverts and aircraft they were operating at the time." Douglas DC-6A PH-TGA 'Dr. Ir. M.H. Damme' at Southend. Since PH-TGA was registered 17Jul53 and rereg'd PH-DFA 19Feb1954, this is the time span this photo was taken. 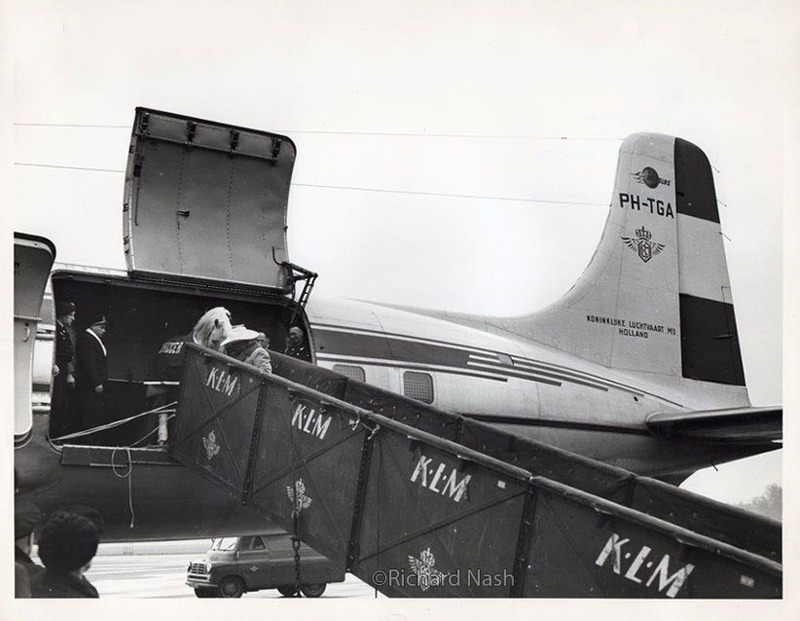 UPDATE: In Dec.2015 Andy Dickson wrote: "I think the photo of PH-TGA at Southend may actually be at Prestwick, and the ‘cargo’ being off-loaded is Roy Rogers and Trigger, who arrived there on 14th Feb 1954 at the start of their UK tour." http://tinyurl.com/pzobjhj - Google / Glasgow Herald Feb 15, 1954 (page 8/12). 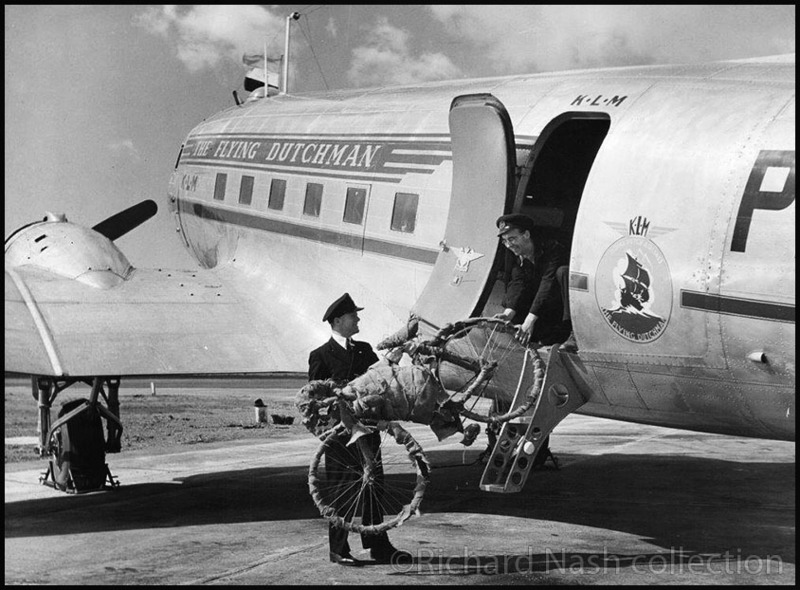 Following information was from the website www.edcoatescollection.com: "In 1953 KLM purchased two purpose built DC-6A freighter aircraft. 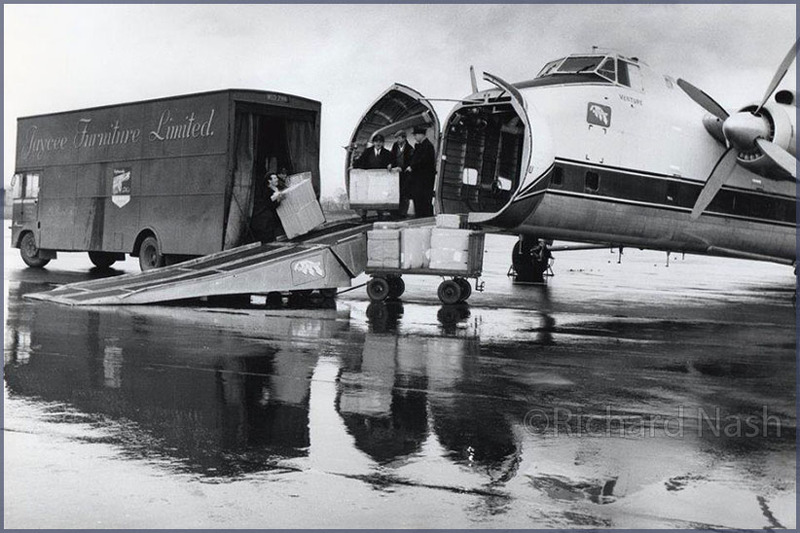 KLM's cargo operations had started to take off in a big way and they needed these dedicated freighters. 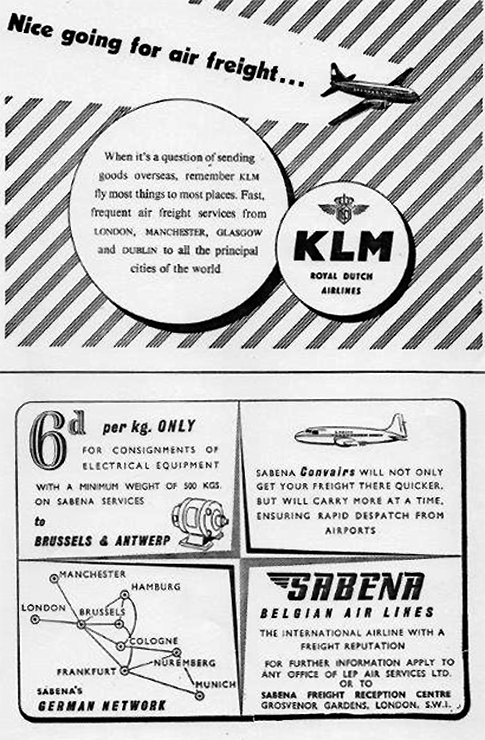 Many DC-6As were built as "windowless wonders" but KLM's both (the other was PH-TGB) had windows, making them more or less convertible to passenger aircraft should the need arise. Both were sold off in 1960, PH-TGA going to Nevead Aero Trades (who leased them out to a number of carriers) as N6574C." From my onw records I found this was actually the first DC-6A delivered outside the USA. 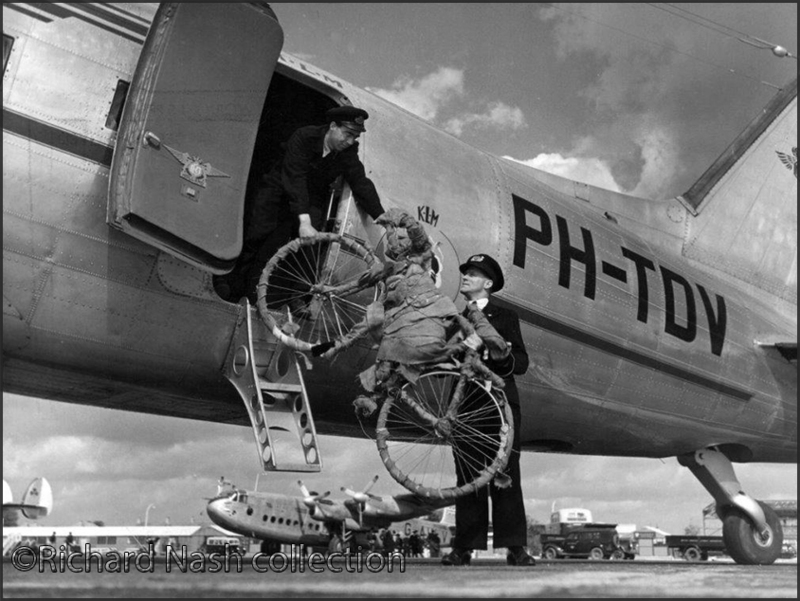 Dlvd to KLM 18Jul53, rereg'd PH-DFA 1954. 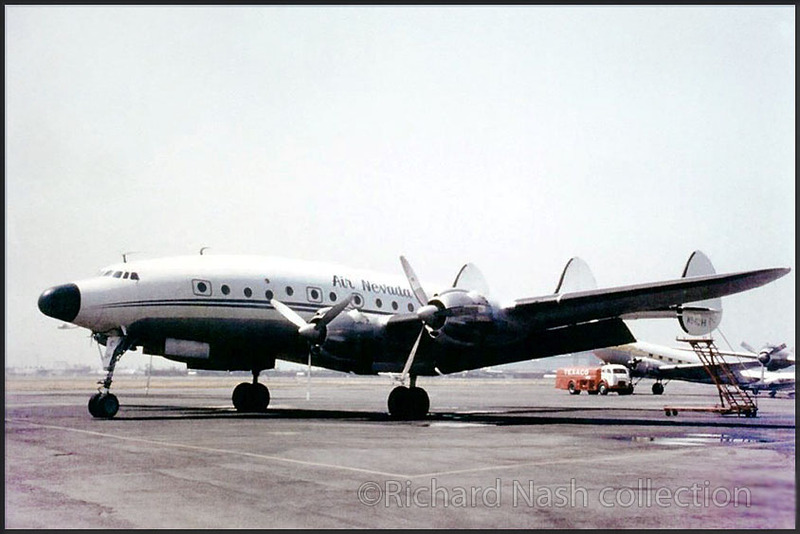 Sold May 1960 to Trans Alaskan Airlines and reg'd N6574C; remod to pax DC-6B in 1955. Operated by Great Lakes Airlines,Trans Alaskan again, to Admiral Airways. June 1964 to Zantop (changed its name to Universal Airlines in 1966). 1967 Boreas Corp.
Bought by Span East Airlines and reg'd N611SE in Jan. 1970. In 1971 to Quanama West Indies; that same year to Alcon (Bolivia) and reg'd CP-947. It was damaged on landing at San Juan (Bolivia) and was declared 'damaged beyond economic repairs', written off. 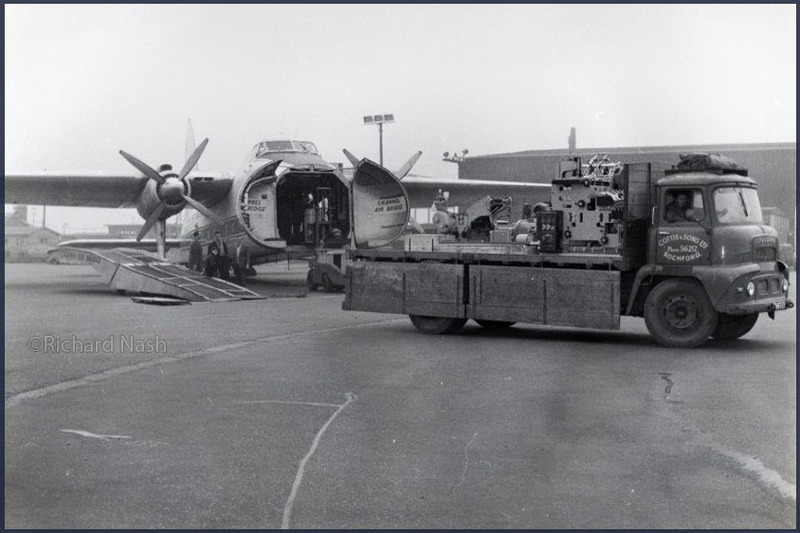 A Bristol Freighter being loaded at Southend; no further details available. in operation with Channel Air Bridge (Feb 59 to Jan 63). That ACL insignia may have some bearing on ACL Aviation Support, which was a handling company at Southend Airport. Comments welcomed (EMAIL, pls provide url in correspondence). long nosed Mk32 standard in (I believe) Jan and May 1958". 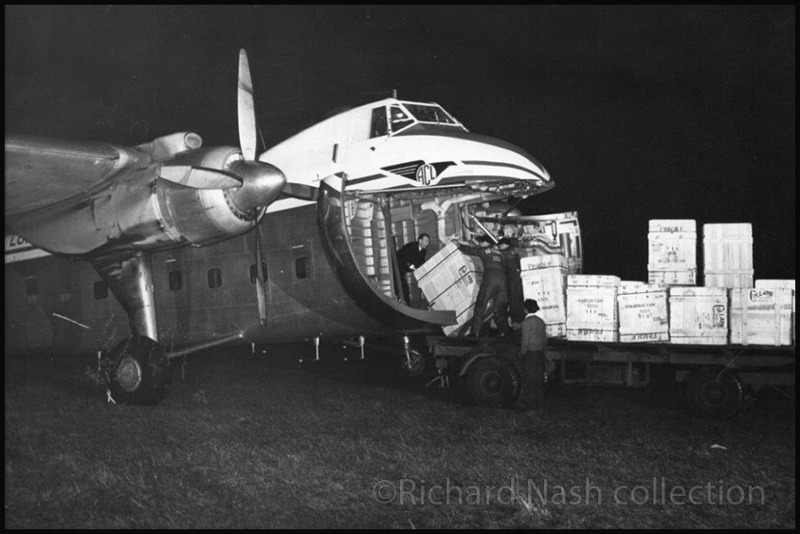 And here is another image of the Bristol Freighter; (un)loading is still very much a manual matter! 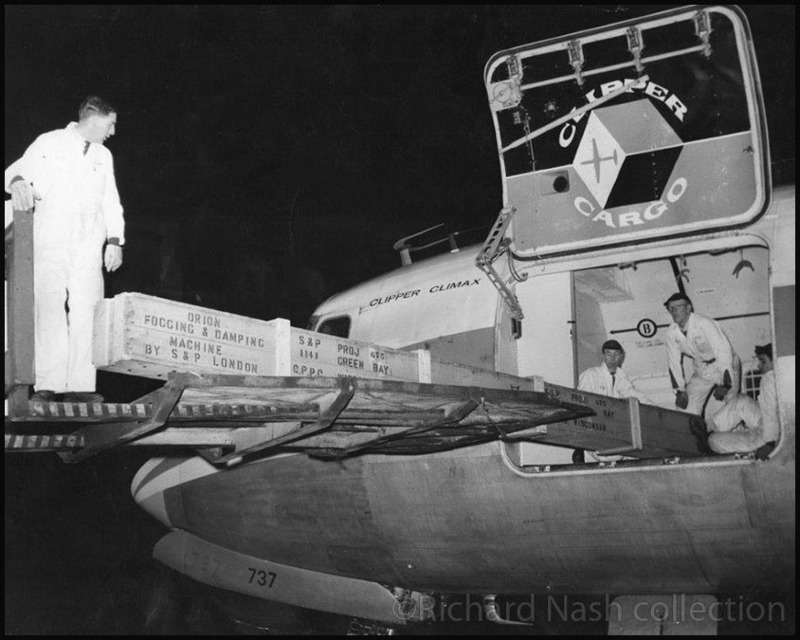 Also from the Richard Nash Collection, a Douglas C-54A being loaded with cargo. Richard Nash shared this photo with in 2012: G-APEP is seen at the Brooklands Museum (no date). G-APEP was built as Vickers Vanguard 953C (c/n 719). G-APEP flew with BEA, then British Airways, then to Air Bridge Carriers (ABC), which changed into Air Bridge and later to Hunting Air Cargo (1992 - 1998). The Vickers Vanguard was a British short/medium-range turboprop airliner introduced in 1959 by Vickers-Armstrongs, a development of their successful Viscount design with considerably more internal room. The Vanguard was introduced just before the first of the large jet-powered airliners, and was largely ignored by the market. Only 44 were built, ordered by Trans-Canada Air Lines (TCA) and British European Airways (BEA). After only about 10 years service TCA experimentally converted one of theirs to a freighter configuration, calling it the Cargoliner. This was considered successful, and in the early 1970s most were converted to freighters, those from BEA becoming the Merchantman. 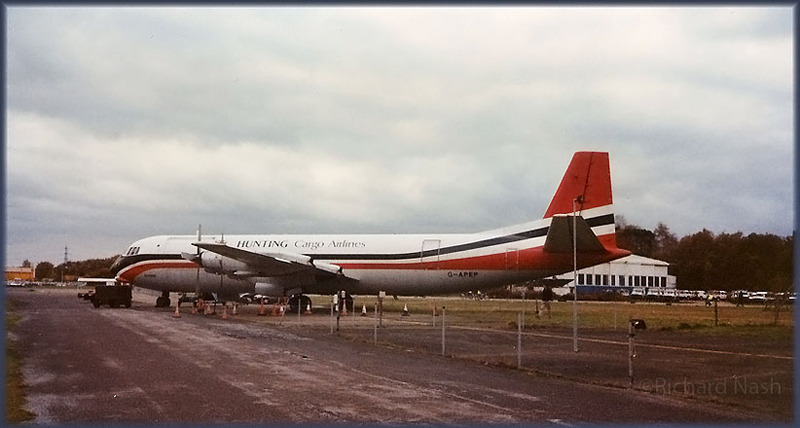 These freighters remained in service for many years, with the last one (G-APEP) only retiring in 1996. 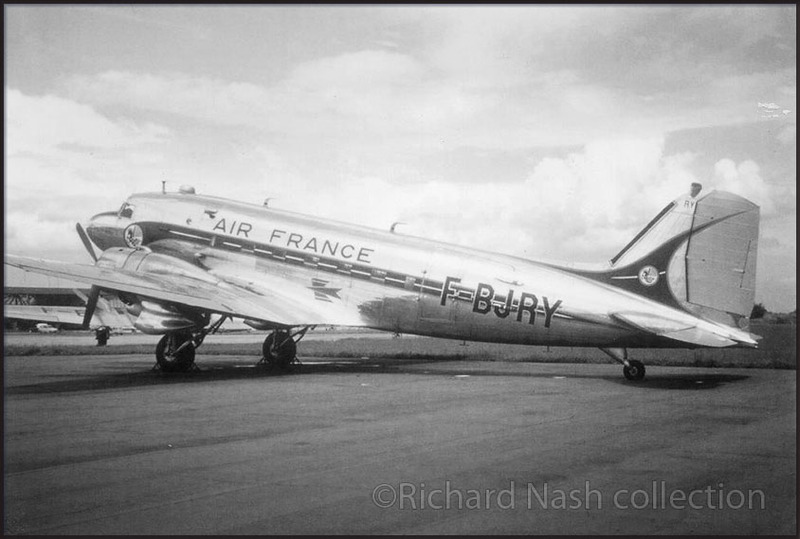 Also by Richard Nash is F-BASN, a Breguet 763 Provence, operated by Air France. Note in the background 2 Curtiss C-46s of Capitol Airways/Lufthansa. Breguet 763 Provence F-BASN had c/n 1. It was scrapped at Dakar at some point. The Breguet 761/763/765 were a family of 1940s and 1950s French double-deck transport aircraft produced by Breguet. The aircraft were normally called the Deux-Ponts (Double-Decker) but it was not an official name. Breguet began design work on the Breguet 761 two-deck airliner even before the end of the WWII, in 1944. The French Government ordered 12 production aircraft, the Breguet 76-3 which were later redesignated Br.763. Six aircraft were to be operated by Air France and the other six by the Ministry of Transport. The 763 had more powerful engines, an 1.20 metres (3 ft 11 in) larger wingspan, strengthened wings and three-crew flight deck (earlier aircraft had four crew). The 763 first flew on 20 July 1951 and entered service with Air France during autumn 1952. During 1964 Air France transferred six Br.763s to the French Air Force. The air force also acquired the three pre-production Br.761S aircraft and four new Br.765 Sahara freighter aircraft with removable cargo doors. Projects to build versions powered with British engines (for possible United Kingdom buyers) did not come to fruition. The projects would have been the 766 (with the Bristol Hercules radial engine), and the 767 with British turboprop engines. The prototype Br.761 entered service with Air Algérie in 1952 as a cargo aircraft. It was withdrawn early the next year. Silver City Airways leased a Br.761 for three months in the summer of 1953 for use on the Hamburg - Berlin route. It was rumoured that Silver City Aws would purchase 3 aircraft, but this did not materialise into a sale. 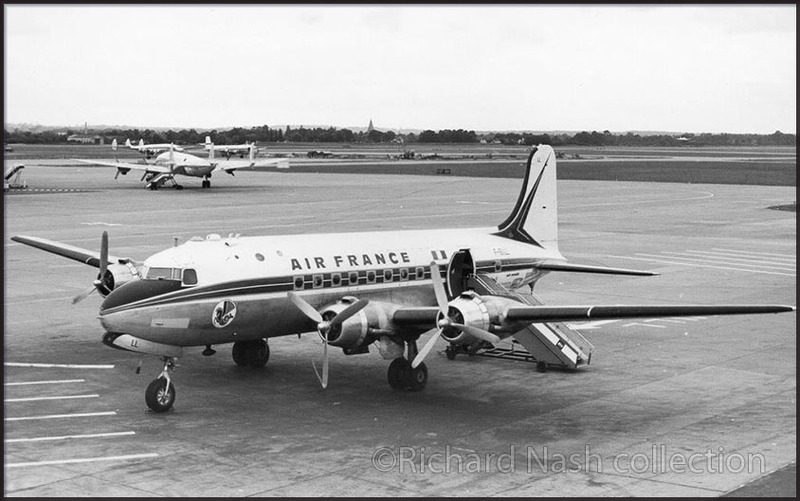 The Breguet Br.763 Provence entered service with Air France on 10 March 1953. The inaugural route was Lyon - Algiers. The type was used on European routes from Paris, mainly to the Mediterranean area, but occasionally to London. 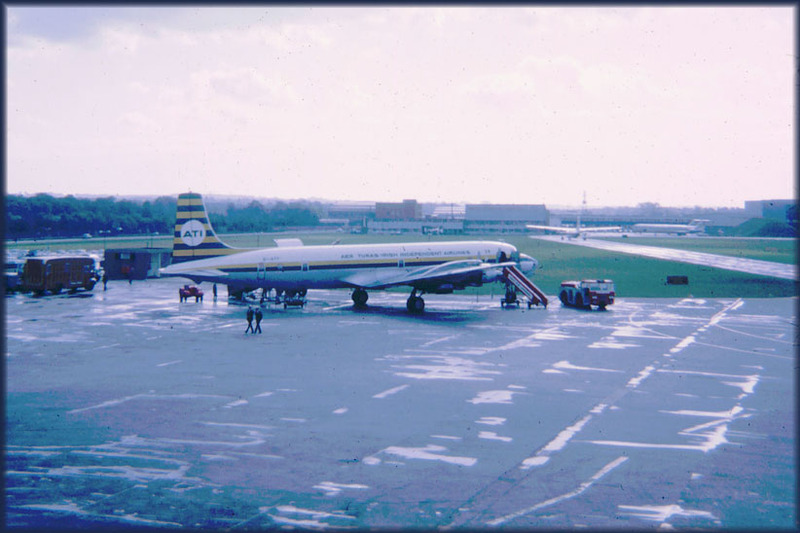 Richard Nash sent these images from his collection, taken at London-Gatwick. 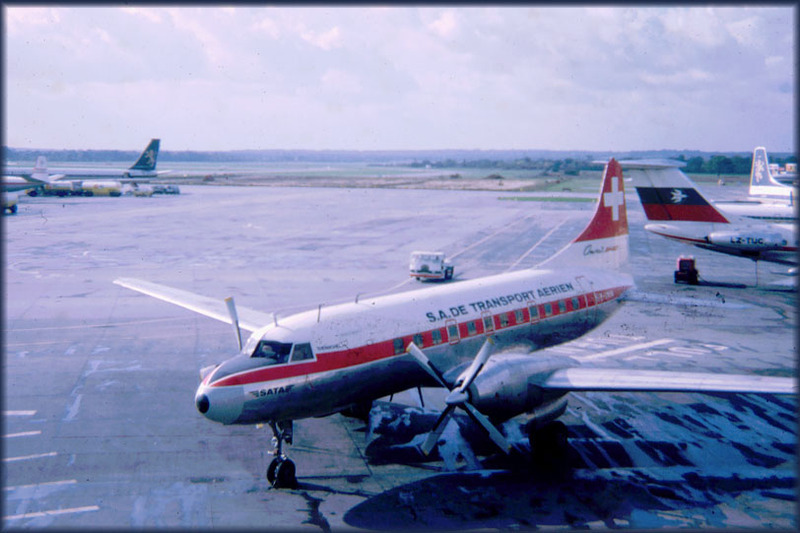 'SA de Transport Aérien (SATA) or SA de Transport Aerien Genève, was a Swiss airline founded in June 1966, with its head office on the property of Geneva Airport, and with its base in Geneva. It finished its activities in 1978. It started as an air-taxi operator and evolved to passenger and cargo charters to points in Europe, the USA, South America and the Caribbean. which included the CV640 HB-IMM (c/n 412) - which must be the one depicted above. ATDB also included in the fleetlist Vickers Viscounts HB-ILR and HB-ILP. 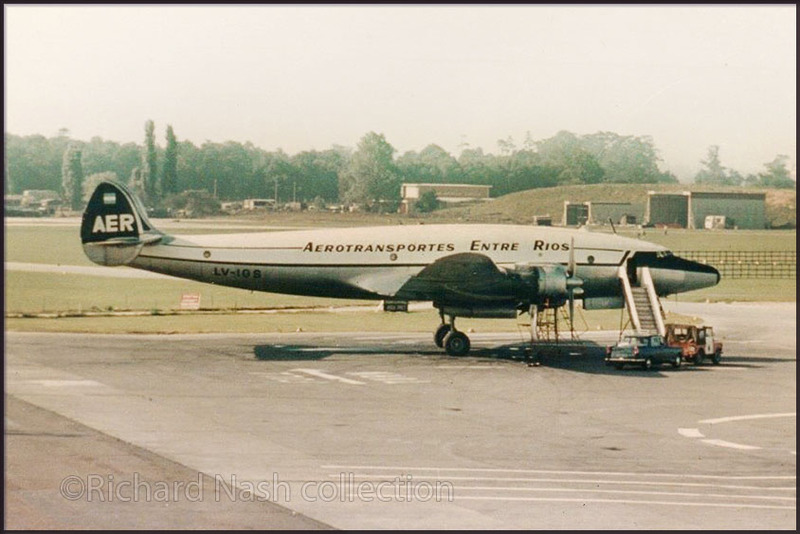 Another one taken at Gatwick, Aer Turas (a 'Freightdog' from Dublin, Ireland which was founded in 1962 and acquired by Aer Lingus in 1980) Douglas DC-7. 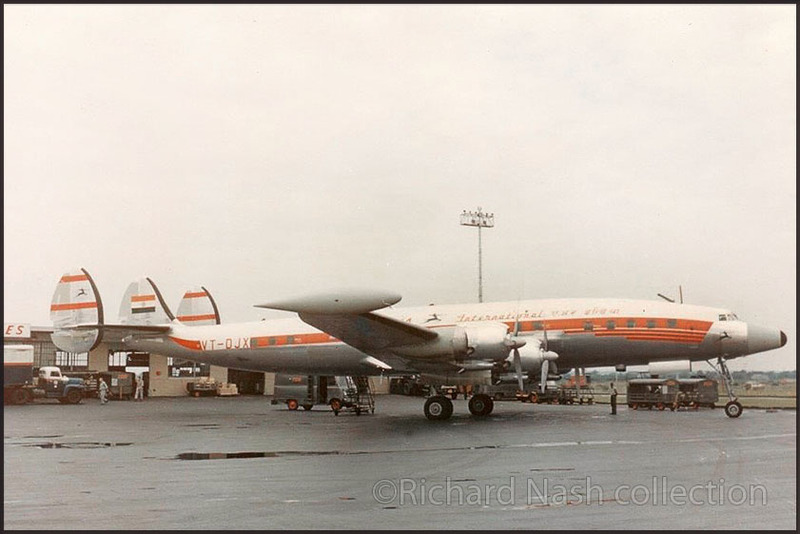 I thought I could make out 'EI-AYY' in the photo, but according to ATDB.aero this can not be correct; the likeliest choice would be EI-ATV: DC-7C/F (c/n 45188), ex/ KLM PH-DSI (ended with Compagnie Gabonaise d'Affrêtements Aériens as TR‑LNZ, was scrapped at some point). 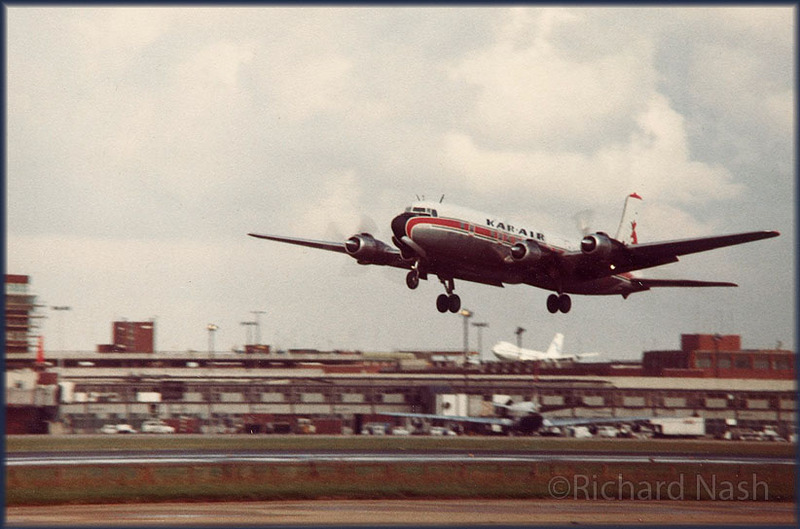 A very nice shot of a Kar Air (1957-1995) DC-6BF on take off from London-LHR. Kar-Air (IATA KR, ICAO KAR) was formed to succeed 1951-born Karhumäki AW (itself formed originally in 1933 as Avoin Yhtio Veljekset Karhumäki). 27% and later 51% stake was taken by Finnair in 1962 (later 29.8% increased 1990 to 90%), along with 45% with Selen Shipping Co. Integrated into Finnair in Dec.1995. Air Links (1958-1966) was renamed/merged to Transglobe AW (United Kingdom, London-Gatwick), which existed from 1966 to 1969. The following C-4 Argonauts were listed as having served Transglobe Airways: G-ALHC, G-ALHH, G-ALHI, G-ALHM, G-ALHT and G-ALHW. Starliner c/n 1040 was delivered to Lufthansa December 1957 as L1649A D-ALAN. 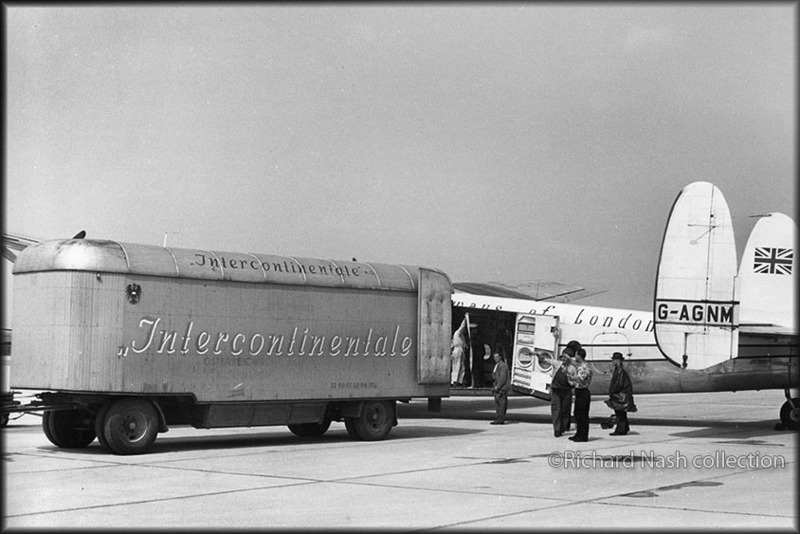 After conversion to freighter it was returned to Lufthansa on 27Jul1960. Mike McHugh added the following comment to this photo: "the Bristol Superfreighter in the centre is G-APAV and is painted in Sabena colours. I don't know what services it operated but I photographed it at Southend in July 1964." To which Keith added: "The Sabena B.170 was used on the regular Southend to Ostend run." 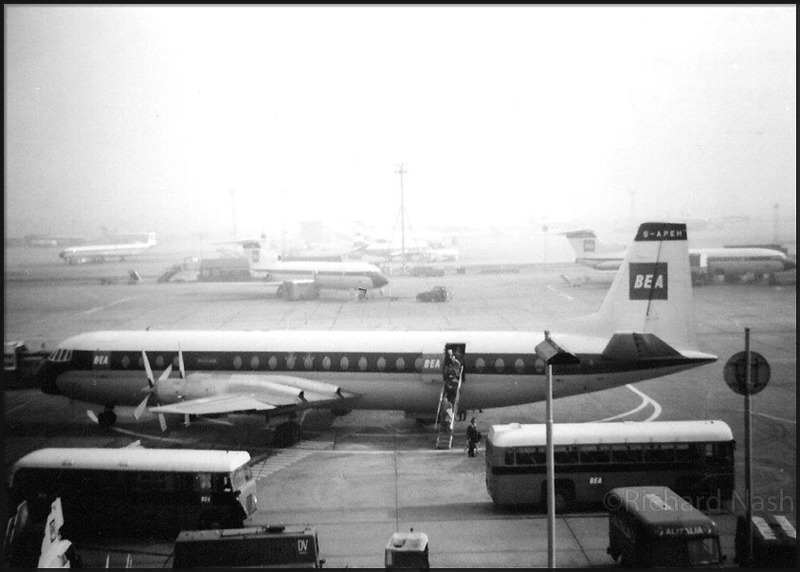 Richard: "Also visible a BEA Vanguard Viscount and British Eagle Britannia. Not very good quality I am afraid, as I could only afford a Kodak Instamatic in those days." This is c/n 4137 and it is still 'around' ! It was delivered to US Navy in 1953 as R7V-1 BuN 131636, two years later transferred to the USAF (C-121G 54-4062) and only retired 1978 when it was flown to Davis Monthan AFB for storage. Briefly reg'd to DMI Aviation in nov.1989 as N2114Z, it was bought by Aerochago in Jan.1990 and reg'd as HI-583CT. As such it was a frequent visitor to Miami. HI-583CT was stored at Santo Domingo (Dominican Rep.' in March 1993 after the FAA banned Dominican cargo carriers from operating in the US! Reg'd to Super Constellation Flyers Association (SCFA) in Sep.2000 and reg'd N105CF in Oct.2000. 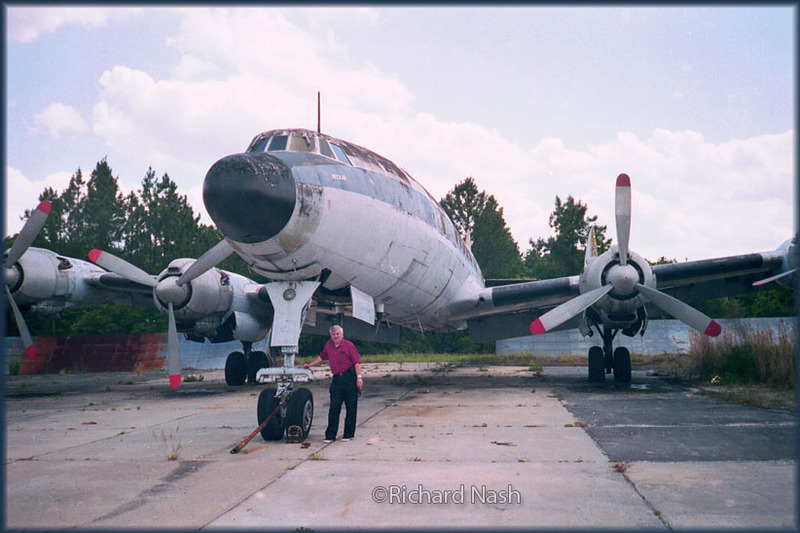 It was restored for a ferry flight from Santo Domingo to Opa Locka, FL on 07Nov2000. 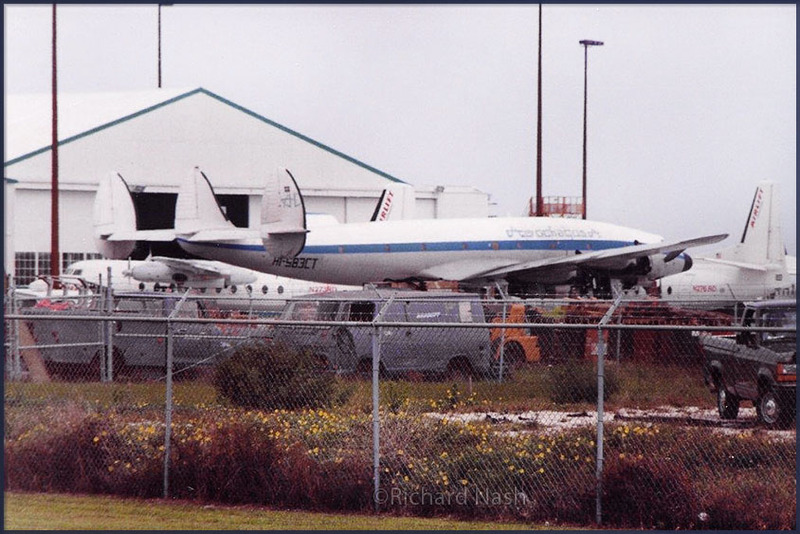 The next leg, Opa Locka to Conroe, TX was on 04Jan2001 - where aircraft was forced to land for engine and hydraulic system repairs. The ferry was completed upon its arrival at Avra Valley,AZ on 07Jan2001. Restoration was well underway in August 2002 when the SCFA suspended efforts due to their inability to obtain a standard airworthiness certificate from the FAA. The remaining engines were shipped to Switzerland during early 2006 and the aircraft was put up for sale in 2007. It appeared to be stripped of useful spares: radome, cowlings, prop and miscellaneous parts were gone by 16Oct2007. Then in wearly 2010 it was reported as sold to the Historical Aircraft Restoration Society (HARS) of Australia. HARS plans on moving the aircraft to Australia, where it will be restored for static display. 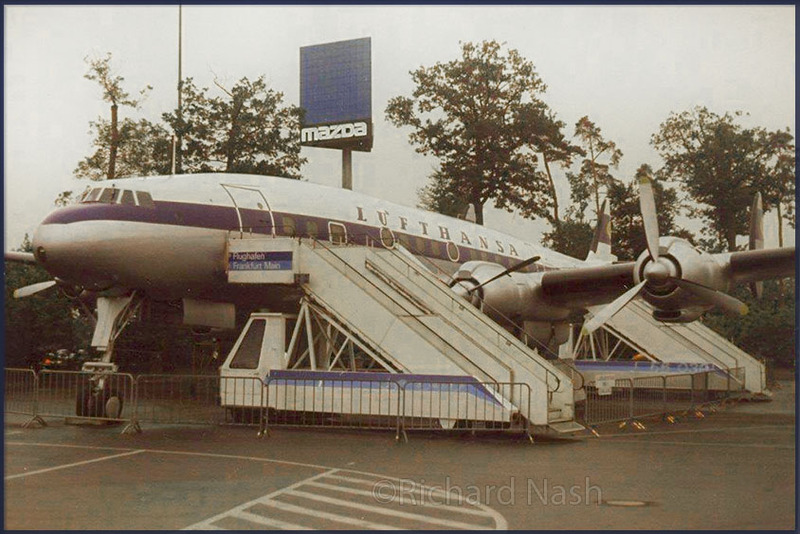 This Lockheed Super Constellation at Frankfurt is probably the Super Connie displayed during the 1970s at Frankfurt, with the fake registration D-ALAP. 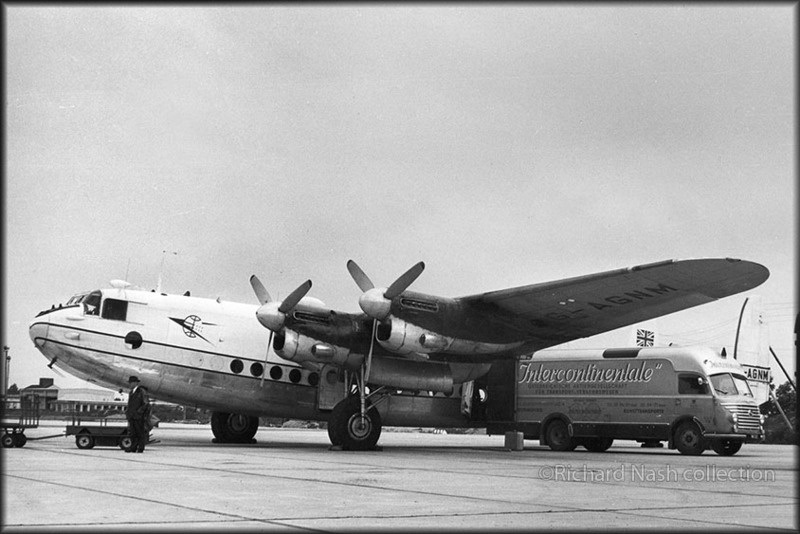 Delivered to Air France durting Feb.1957 as L.1049G F-BHML, named 'Maurice Nogues' by Nov.1960. 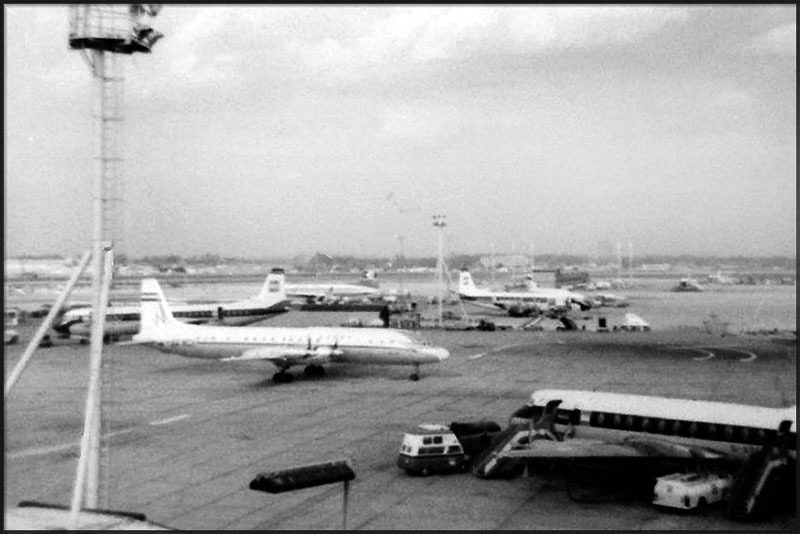 It was leased to Tunis Air in the summer of 1961 and when returned to Air France, stored at Paris-Orly (Sep.1961). Then there was a change of mind and F-BHML returned to service (no date). This lasted until 16Oct1963 when it again was stored at Paris Orly. And yet again it returned to service, on 12Jul1965. F-BHML joined Compagnie Air Fret on 08Mar1968, which lasted until august 1976 when Air Fret stored 'ML at Nimes-Garons. Two years later, in Nov.1977, it transferred to Air Classics. On 27Jun1978 BHML was ferried Nime-Garons to Düsseldorf. It was painted in Air Classics color scheme, with false registration D-ADAM, by Jan.1979. Then it was moved from Düsseldorf to Frankfurt Rhein-Main Airport in June 1985 and yet again marked with false registration: D-ALAP. In 1993 it was moved from Frankfurt to FJ Strauss International Airport, Munich. Ownership transferred to Munich Airport Authority in March 2000. Extensive restorations followed and the aircraft reopened in May 2001. Painted in 1955 Lufthansa color scheme with (yet again!) a false registration D-ALEM to commemorate Lufthansa’s first trans-Atlantic flight on 08Jun1955. The cabin serves as a cinema, showing historical films of Lufthansa Super Constellation flights. Catair is an abbreviation of Compagnie d'Affrêtement et de Transport Aérien, which had its base at paris Le Bourget and operated during the years 1969 - 1977. 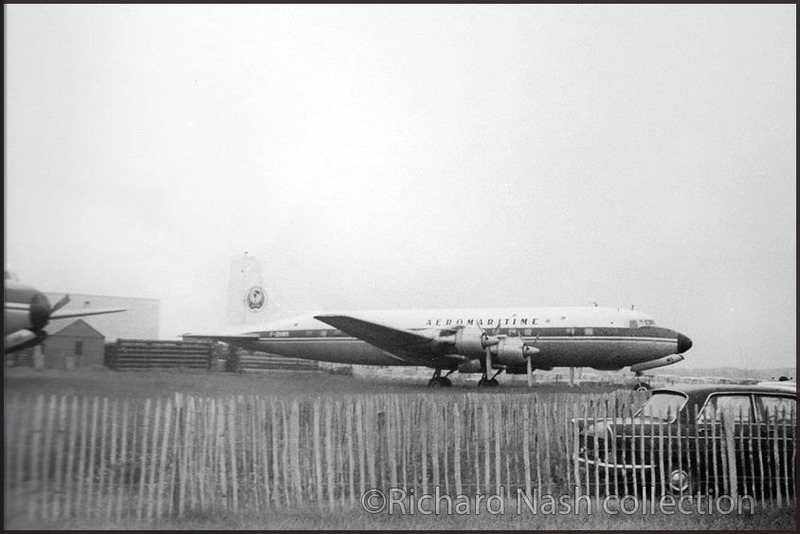 It operated several L.1049G Super Constellation: F-BGNC (which was destroyed at Douala 09Aug69), F-BRNH (scrapped at Pontoise), F-BGNG (scrapped at Nimes), F-BHMI (srapped at Pontoise) and F-BRAD (preserved at Nantes). 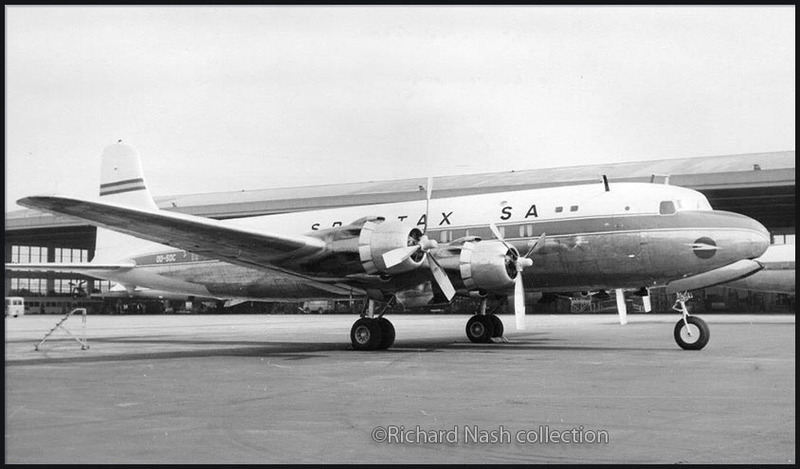 Catair also operated a number of SA Caravelles. "I had just arrived in Gibraltar, on G-APEU Vickers Vanguard. What a nice aircraft to fly in!" The Conroy Skymonster (CL-44-0), "Here is a photo of me (in Blue Lep T Shirt) at Southend, many years ago, helping to load the Skymonster during a Dock Strike." Text readable on the inside of the cargodoors: "Channel Air Bridge". The truck has "Cottis (Cott's?) & Sons, Rochford". Photo taken at Southend. Channel Air Bridge was a UK airline which operated 1959 - 1962. It was formed by Air Charter (originally an internal division in 1954 with first service 14/4/55 from Southend). Merged with Silver City's ferry division, forming BUAF. 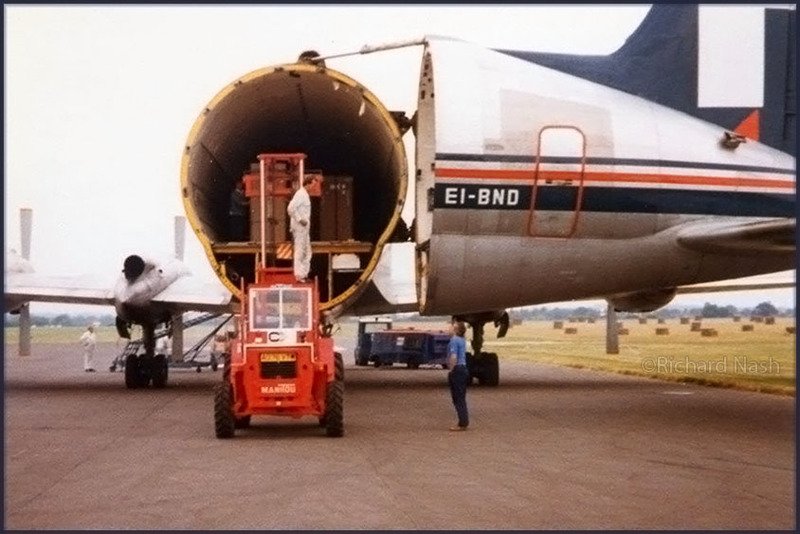 Cargo under discussion, to be loaded, or offloaded, from Bristol Britannia G-ANBH. G-ANBH is a Bristol Britannia 102 (c/n 12909). 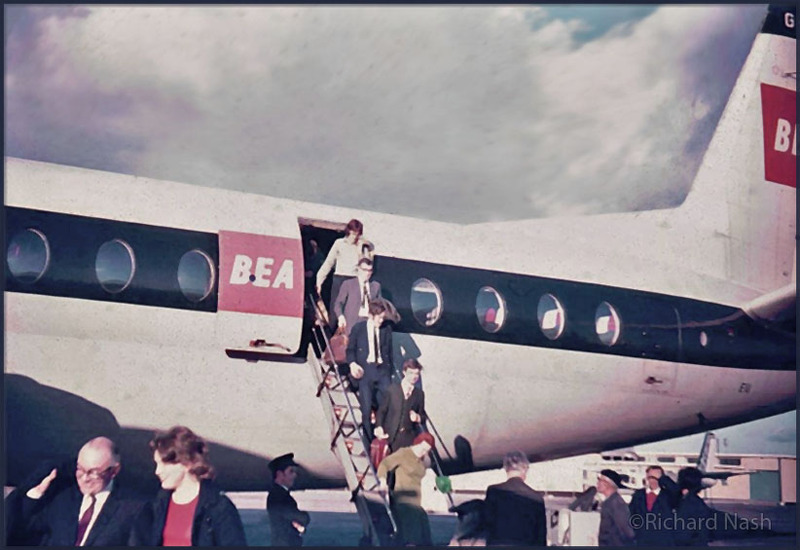 Initially operated by BOAC, it went to BKS, to Nigeria Airways (maintaining registration G-ANBH) and Northeast Airlines. It was scrapped at Southend-Rochford airport. By the time development was completed, "pure" jet airliners from France, United Kingdom and the United States were about to enter service, and consequently, only 85 Britannias were built before production ended in 1960. Nevertheless, the Britannia is considered one of the landmarks in turboprop-powered airliner design and was popular with passengers. 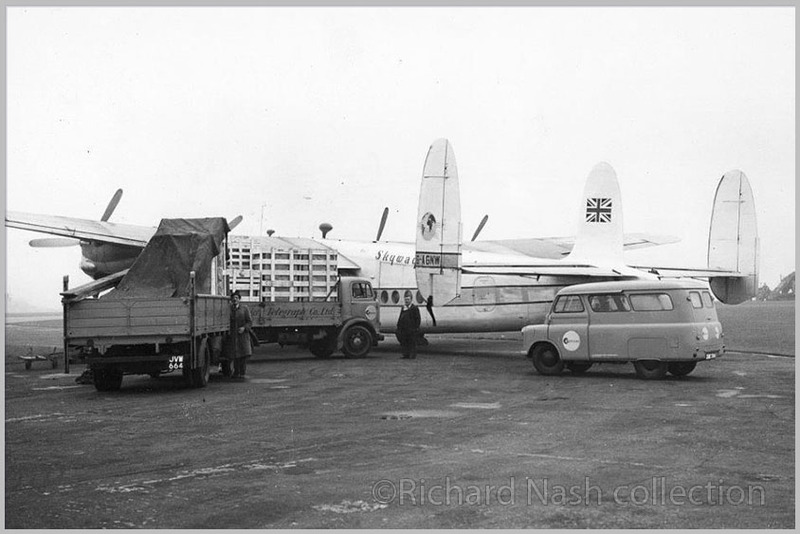 Avro York G-AGNM on a livestock charter. 'Skyways of... ' can be read; with the photo below that would make it Skyways of London. "Skyways Limited was an early post-World War II British airline formed in 1946 that soon became established as the largest operator of non-scheduled air services in Europe. 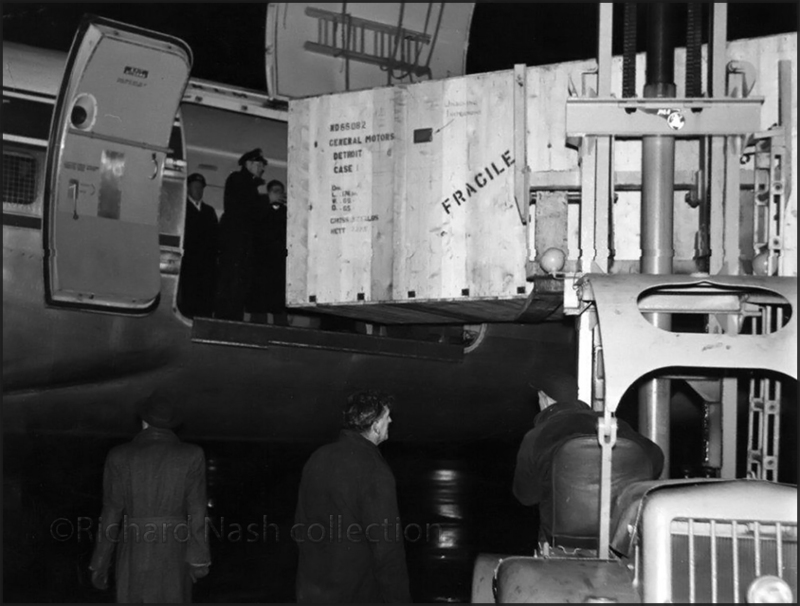 Its principal activities included the operation of worldwide non-scheduled passenger and cargo services, including trooping and oil industry support flights, inclusive tour (IT) and ad hoc charters for automobile industry executives as well as specialist freight services. 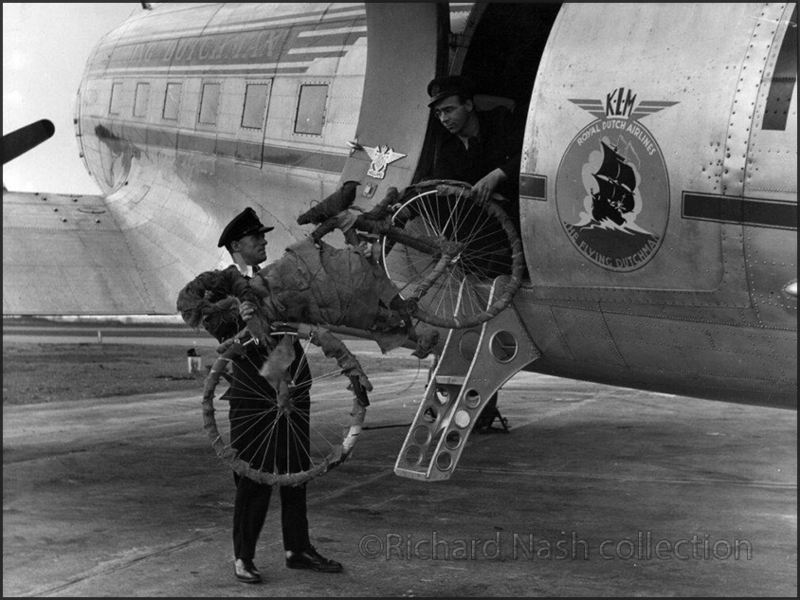 The newly formed airline operated its first flight in 1946 with an Avro York that had been chartered by the Anglo-Iranian Oil Company to carry oil personnel and freight from Langley to Basra via Manston, Malta, Cairo and Lydda. 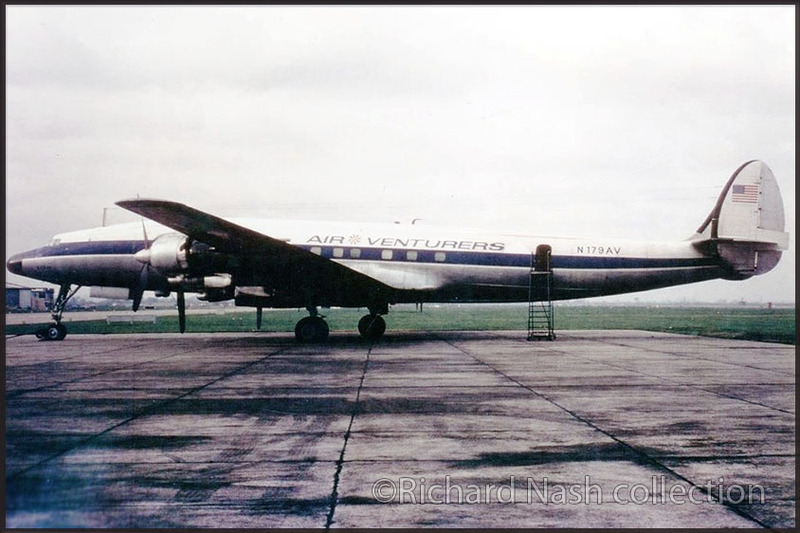 Skyways was a major civilian participant in the Berlin Airlift and became one of Britain's foremost private, independent[nb 1] airlines during the 1950s and early 1960s. 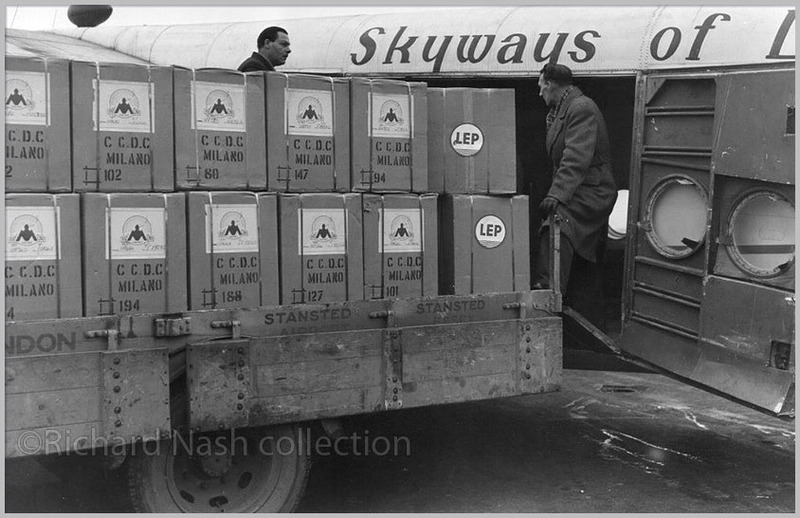 Following the airline's liquidation in 1950 and transfer of the bankrupt carrier's assets to a new company incorporating the name Skyways, control passed to the Lancashire Aircraft Corporation (LAC) in 1952. LAC's acquisition of Skyways resulted in concentration of the combined group's operations at London Stansted Airport." This Avro York production list shows G-AGNM to be broken up in 1958. 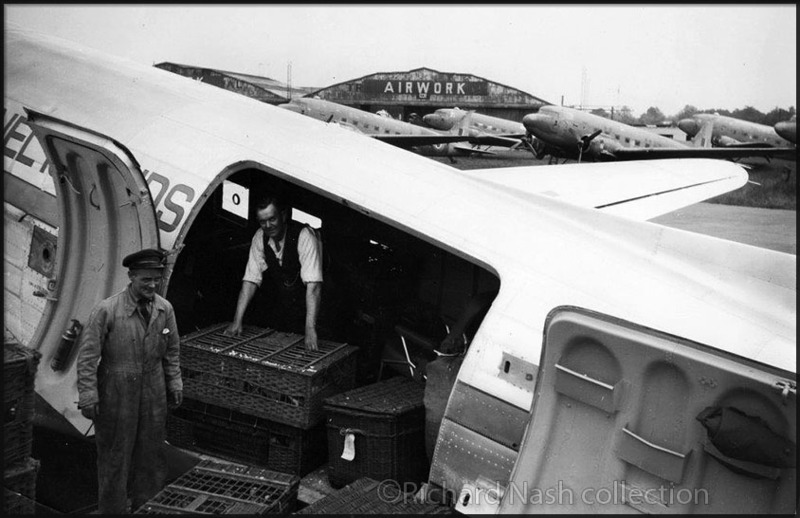 Avro York 685 C.1 G-AGNW of Skyways being loaded with cargo. There is no way that Morris Miror is going up that ramp, is there?! 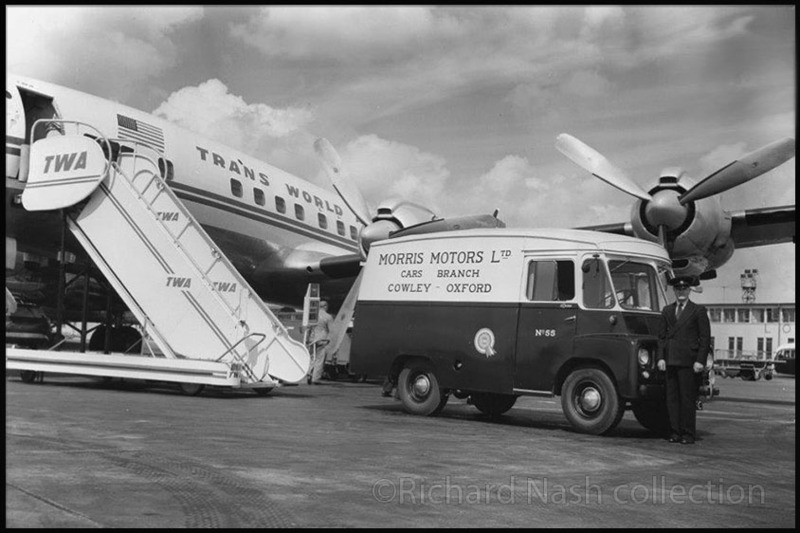 Lockheed L.1649A Starliner of TWA, with a very nice Morris Motors Ltd van. Douglas DC-7C N737PA (c/n 44879/686) of PanAm. a false registra tion N771. It was flown to Chandler-Memorial in Arizona and stored in 1980. Another batch from the Richard Nash collection, uploaded in Sep.2015 and added the various informatio as much as I could from internet sources and own archives. U.S. Army DHC-2 Beavers, serial 82000 (58-2000) and 6405 (56-405). Joe Baugher's magnificent website states L-20A 58-2000 (msn 1326/1880) was delivered 07Apr1959. 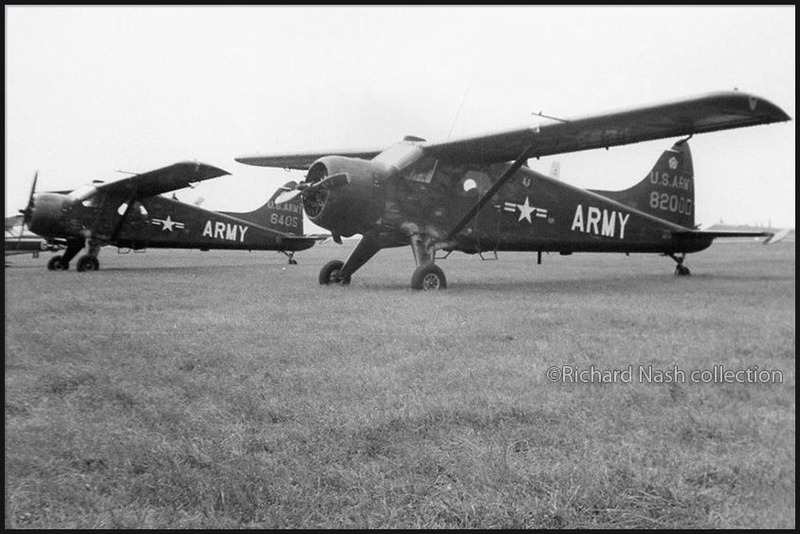 The deHavilland L-20 Beaver entered the Korean War late, but proved to be a superb liaison aircraft and also served later in Vietnam. In 1962 the L-20 was designated the U-6. The U-6A 'Beaver' was manufactured by deHavilland Aircraft of Canada, Ltd. Nearly 1.700 DHC-2 Beavers were built by DeHavilland Canada, between 1947 and 1967; of those, about 970 went to the US Army and the US Air Force as U-6As. More than 200 L-20As went into USAF inventory between 1952 and 1960 to be flown in utility transportation and liaison roles. 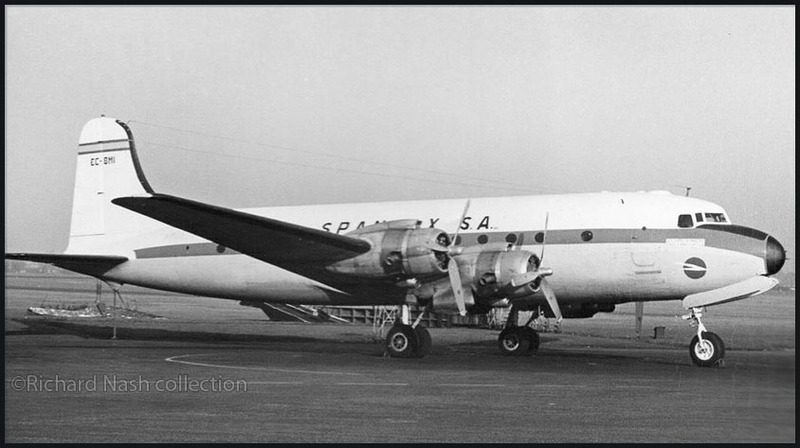 Douglas C-54 EC-BMI (c/n 10440), operated by Spantax SA. No details on where or when this photo was taken. Another 'propliner' operating for Spantax S.A.: Douglas DC-6 OO-SDC (c/n 43064). Sobel air (OO-SDC, leased from SABENA), the lease changed to BIAS (still OO-SDC) and to Air Zaire (same). From there it went to Spantax and this must have been an early picture as it was registered in Spain as EC-AZX. 'Ultimate fate unknown'... Many of these propliners saw use for smugglings drugs and vanished over sea or in the jungle. 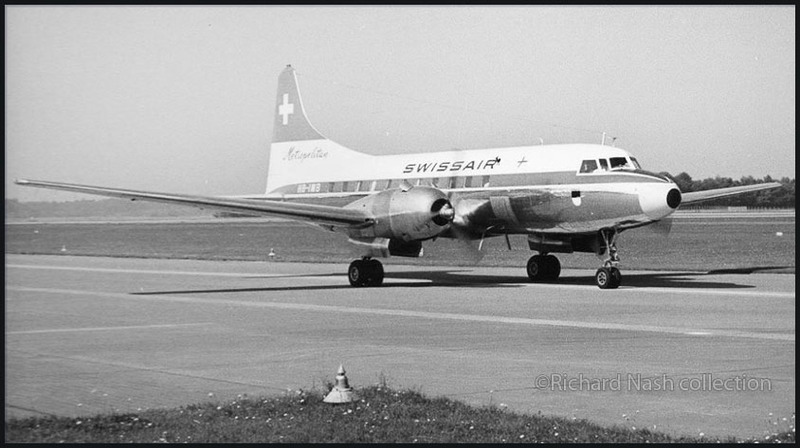 Convair CV440 Metropolitan HB-IMB (327) of Swissair. 12+02) from where it went to Air Serbia and Transadria (YU-ADU). As N47098 it operated for New Jersey AL. Bermuda (pic on Airliners.net), but did not see any use as such and was scrapped in 1970 at Basle / Mulhouse, France. L. Koren - maybe worth to look for it one day. The infamous Frank Wharton (an American of Latvian descent) had ownership of Tango Alpha Lima at some point. N37544 is a bit of a mystery; it would have been nice to know where this was taken and when! Pacific American, but it seems to have disappeared, its ultimate fate unknown! Colin McKeeman made me aware that the same (!) image can be found on the internet, and it has the caption " "N37544 - Douglas DC-6 B at Oakland Airport in 1968". "Sorry, but has been some time since we were in touch but life just seems so busy! Just finished writing the history of the old UK based Birdlip HF communications station, which I hope will go to print next month. Ray Flynn, a long standing friend of mine, just passed me the undernoted, which has some great shots! 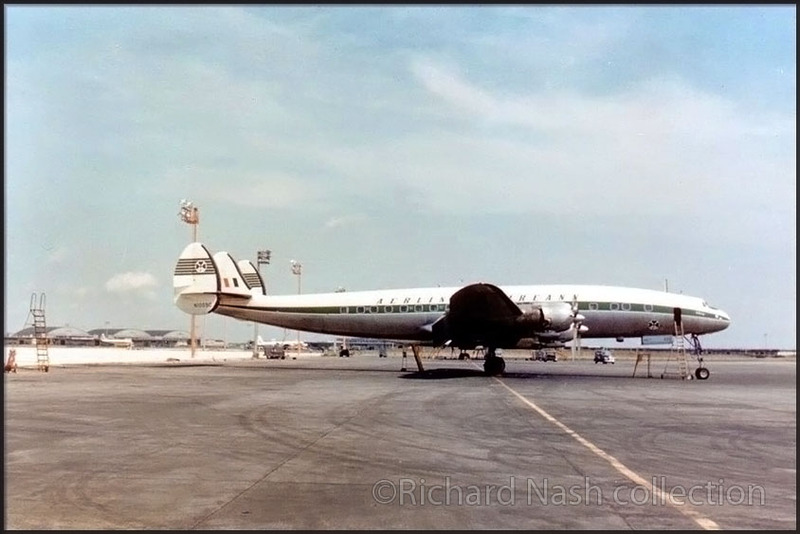 I was particularly looking at the shot of DC-6 N37544 and based on this link http://aflyinghistory.com/search-aeroplane-photographs?query=us&page=78 I think it was taken at Oakland in 1968? Like you I can't find any history post this year except that it is quoted as being scrapped, but where (Oakland?)/when? Hope this helps and great to see you still posting excellent material. 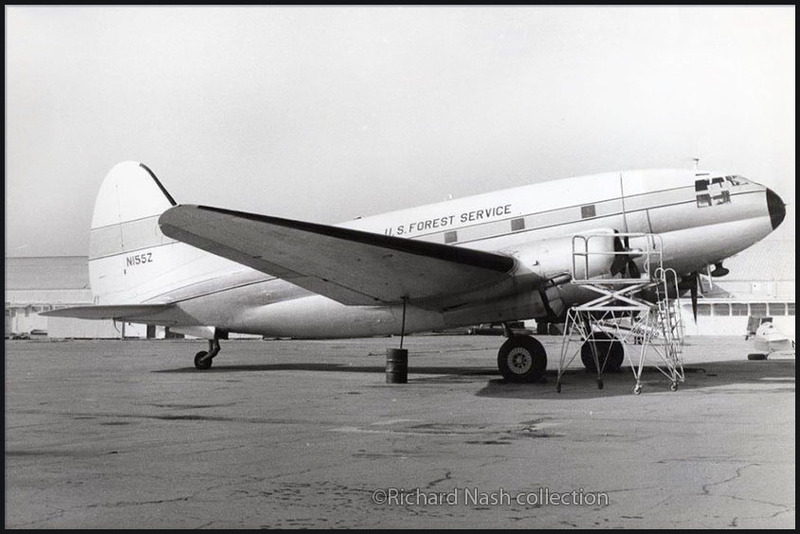 Curtiss C-46A N155Z (c/n 26433) - US Forest Service. No where and when specified. beyond repairs' at Trinidad, Bolivia (details of the crash unspecified: ASN). In april 2016 I added these images sent by Richard Nash (again, not clear whether these were taken by him or from the collection of Bill Hill he was allowed to scan; little info on where & when). 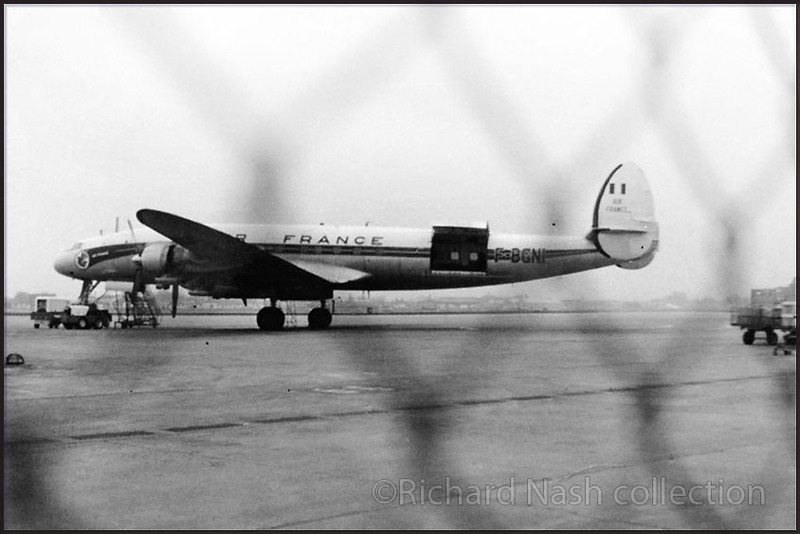 Through the fence: Lockheed L.1049G Constellation F-BGNI (c/n 4518) of Air France, ready to load cargo. 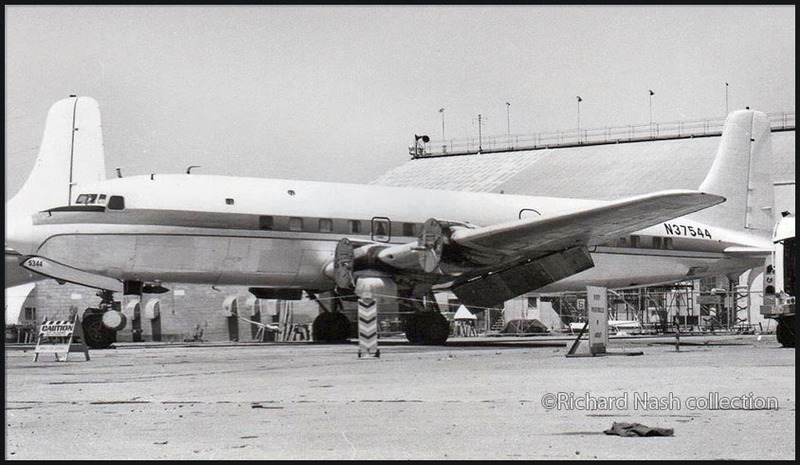 From Air France it went to Air Cameroun (also F-BGNI); it was scrapped at Nîmes/Arles, Camargue/Garons airport. 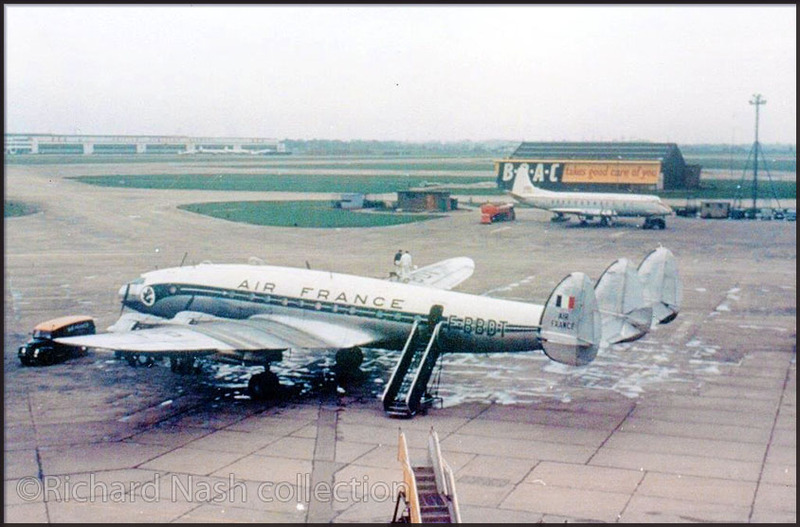 Lockheed L.749A Constellation F-BBDT (c/n 2675) of Air France awaiting its passengers at London-Heathrow (LHR). 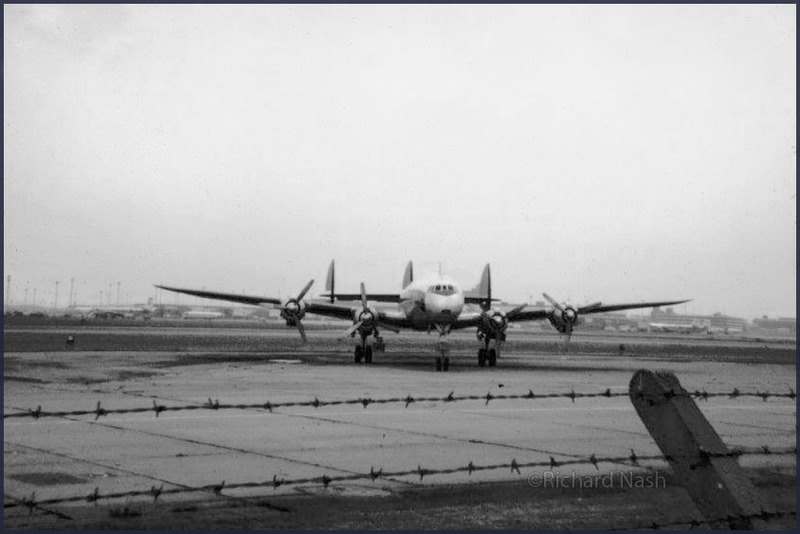 Lockheed L.749A Constellation G-ASYF (c/n 2630) of Ace Scotland. 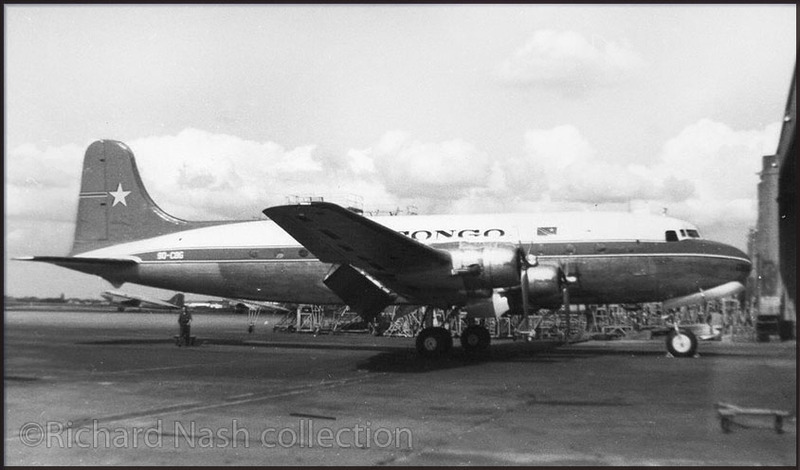 1972-1974 but they did not operate Lockheed Constellations, only one DC-3 (N18255, c/n 4583). Before being reg'd G-ASYF for ACE Freighters it was ZS-DBS with SAA and Flitestar (leased from SAA). After ACE it was reg'd N1939 for COPISA, for spares supply; scrapped after such use was no longer needed. was registered LV-PZX for AER and subsequently rereg'd LV- IGS both for AER. Scrapped at Montevideo. Lockheed Constellation of Air Nevada. I can only make out an 'H' as last digit of the N-number. Lockheed L.1649A Starliner N179AV (c/n 1040) of Air Venturers (Houston,TX 1965-1970). Mike McHugh (Canberra,AUS)commented on this photo:"I think the Starliner N179AV was taken at Heathrow, probably by Brian Stanier. If so it would have been February 1967. Great pictures! Brbought back lots of memories, particularly those at the London area airports. Some of the photos at Heathrow look like the photographer was standing next to me, because I have some almost identical pictures, until you check the aircraft in the background." Super L.1049G Constellation VT-DJX (c/n 4687) of Air India. After civil airliner use it went to (Indian Air Force as BG579), where anno 2016 it may still survive in poor condition. 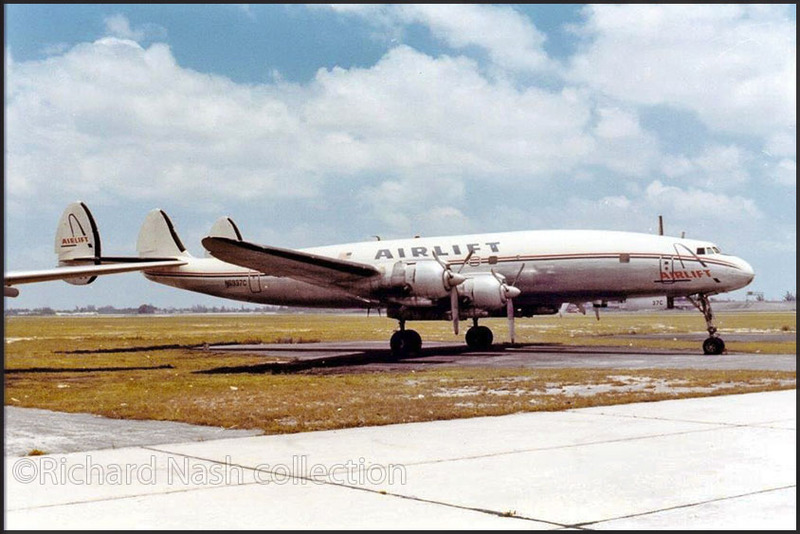 Lockheed L.1049H Super Constellation N6937C (c/n 4830) of Airlift International. in TWA c/s. 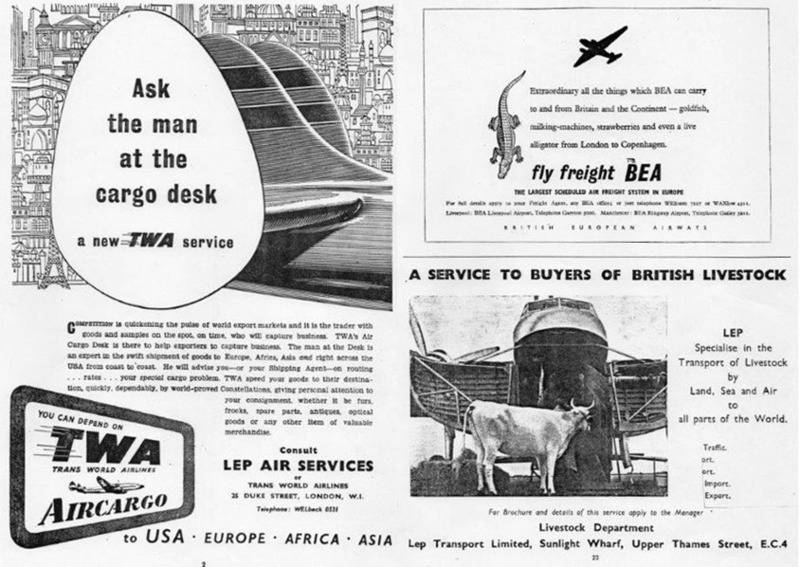 During its career it had been leased by TWA and South American Continental. Douglas C-54 9Q-CBG (c/n 10452) of Air Congo. This image of 9Q-CBG has no signs of its 'Swingtail'-conversion, so it must be taken before end-1966. ZAS 9Q-CBG, finally 9Q-CBK for Kinair Cargo. Destroyed 23Aug88 at Kinshasa M'Bamon Island,River Zaire. 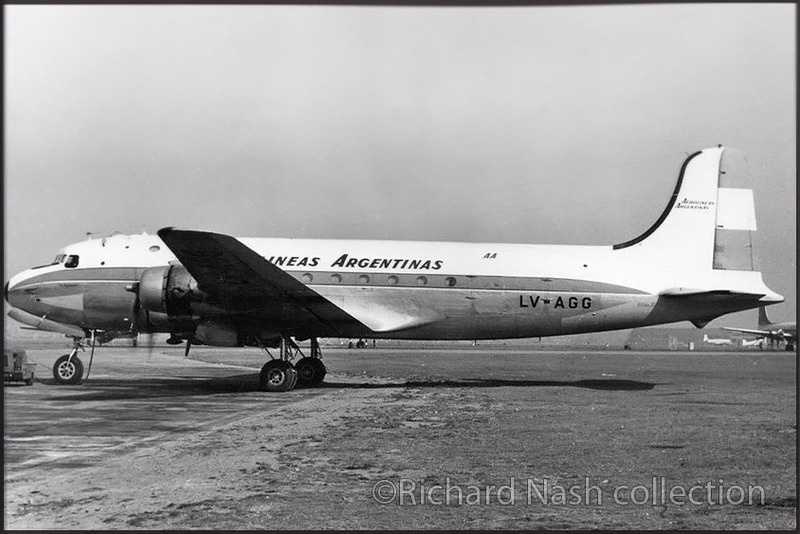 Douglas DC-4 LV-AGG (c/n 10333) of Aerolineas Argentinas. to AL Argentinas, to Aerosur, to Aeropalas (still LV-AGG), to Fri Reyes reg'd as CP-1517 and SATCO as OB-T-1279. 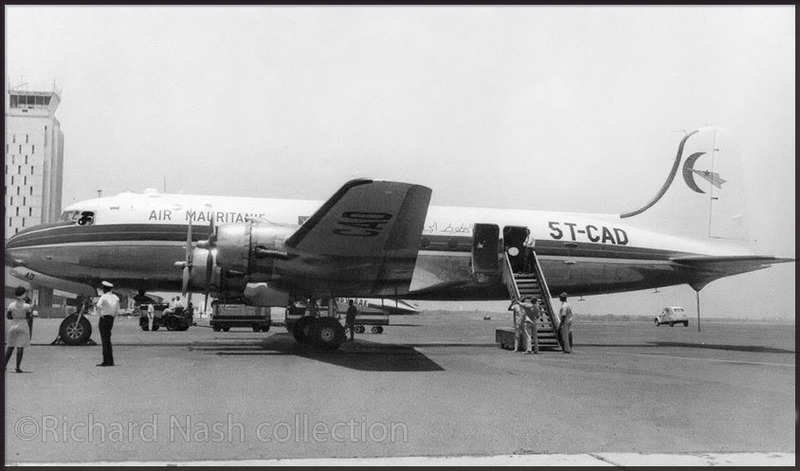 Douglas DC-4-1009 5T-CAD (c/n 42939) of Air Mauritanie. 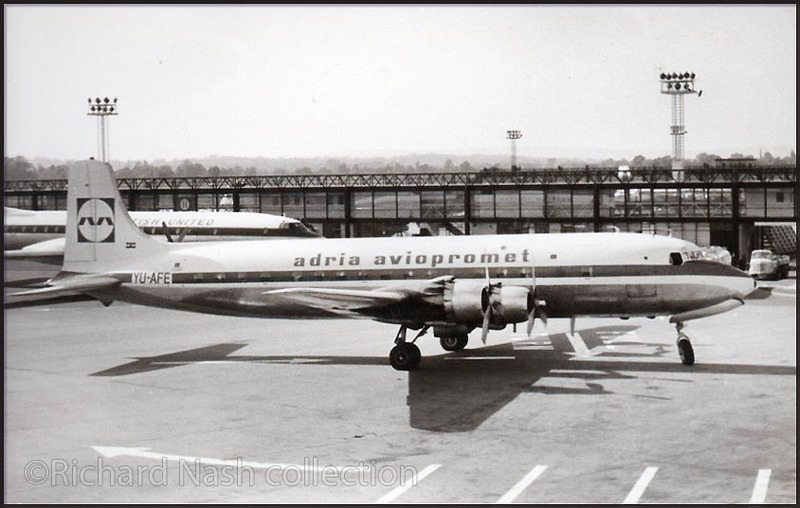 Douglas DC-6B YU-AFE (c/n 43552) of Adria Aviopromet has its nosewheel poitioned for its turn out and departure. Mike McHugh corrected me here, with some local knowledge:"DC-6B YU-AFE is arriving at Gatwick, not departing. It is about to turn so that the fuselage is parallel to the arrow on the ground underneath it and then stop. This was the normal parking position at Gatwck, and many other airports, before aerobridges. The curved arrow in the foreground shows the path the nosewheel will take when the aircraft departs." initially as VR-ABJ but rereg'd as 7O-ABJ and ended as TF-ABJ with Iscargo. Srapped at Reykjavik, Iceland. A Douglas DC-6 of Aéromaritime; alas, its F-number is too vague to read. F-BGOB (c/n 43833, also scrapped at LBG) and F-BHMR (c/n 43842, to Air Djibouti). History on c/n 12255 (courtesy ATDB.aero): C-47A-DK registered to USAF (42-92453), delivered as FZ670 to RAF. It was to become F-BAXX for Air France but the registration was not used, instead becoming TS-AXX for Tunisair. Then onwards to become F-BJRY for Air France, from where it went to Institut Aéronautique Amaury de la Grange. Next it was reg'd as N57927 for Englert Industries and C-GAXT for Québec Aviation. Moving into Latin America this C-47A became TG-AFA for Aviateca Guatamala. The last owner and/or operator was Trans World Shipping Trading, with registered tailnumber N326UN. Reregistration to N667H was not put in effect. Where, how, when its career ended remains a mysterie! 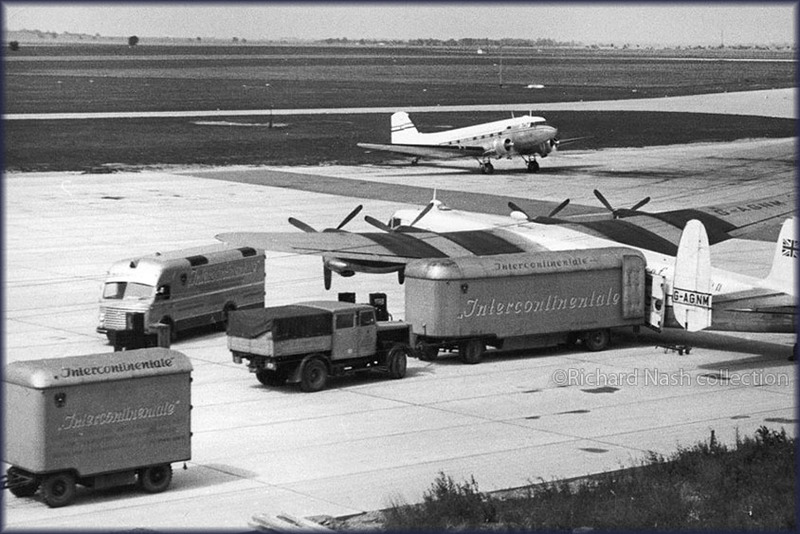 KLM DC-6 or DC-7, being loaded with freight. A large crate from General Motors, Detroit takes some maneuvering..